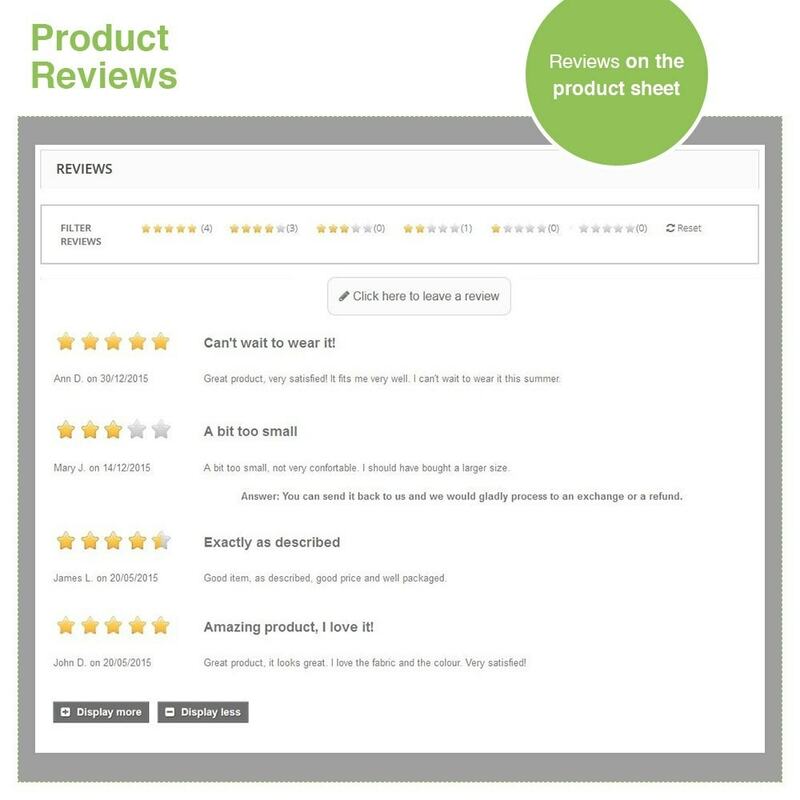 Discover the equivalent of the services provided by eKomi, Trusted Shops, Trustpilot and Verified Reviews without having to pay any subscription. 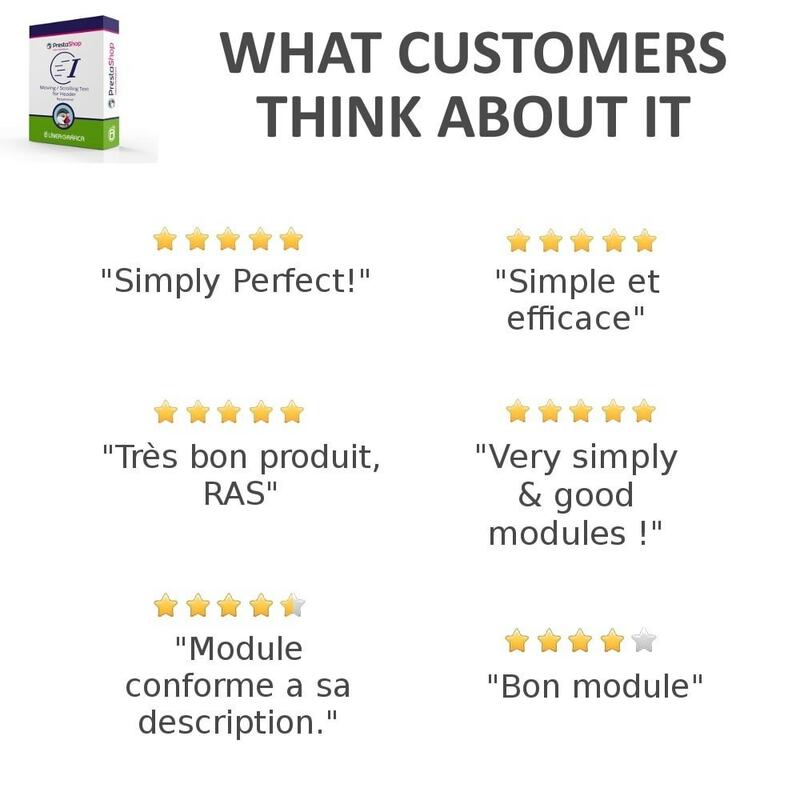 All the services included are free without any limits of time or amount or orders, the only thing you have to pay is the module price. 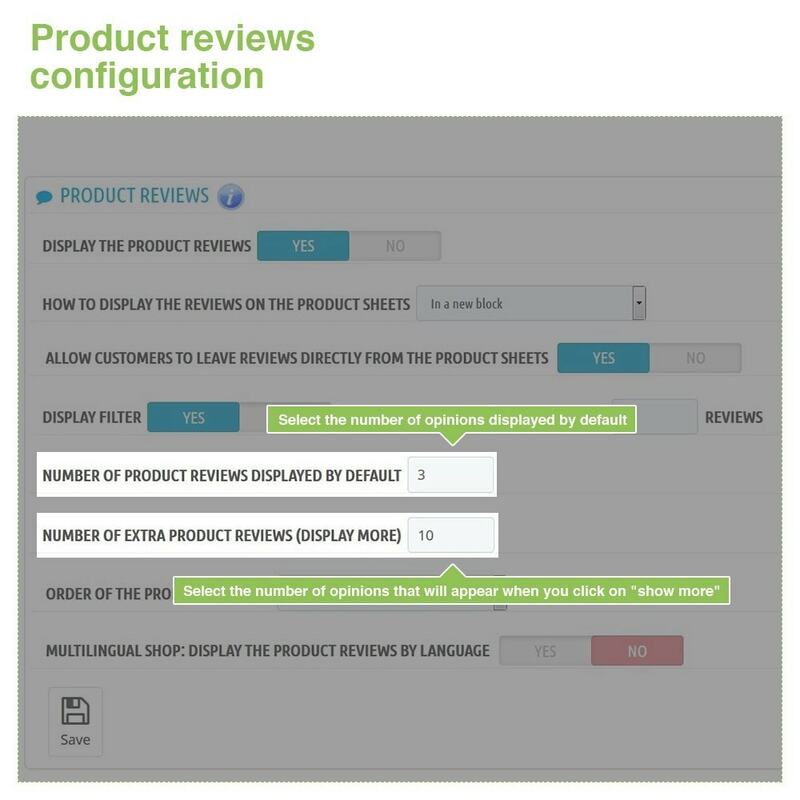 Our module allows you to comply with GDPR in Prestashop version 1.7. 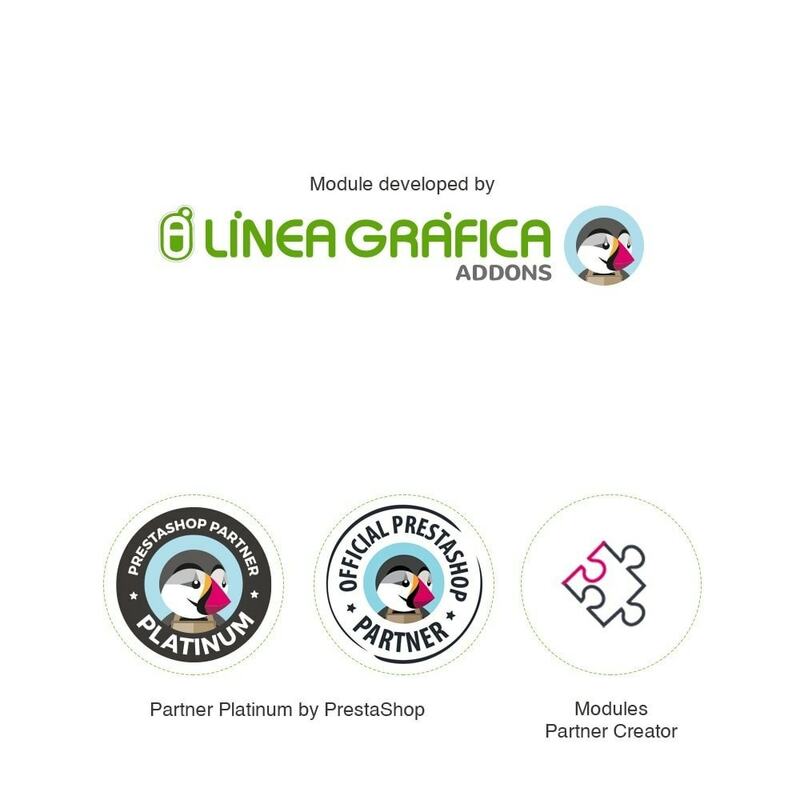 Our module is compatible with the GDPR module of Prestashop, so if you have that module installed in your backoffice, our opinion module will be ready to meet the new demands of the GDPR. 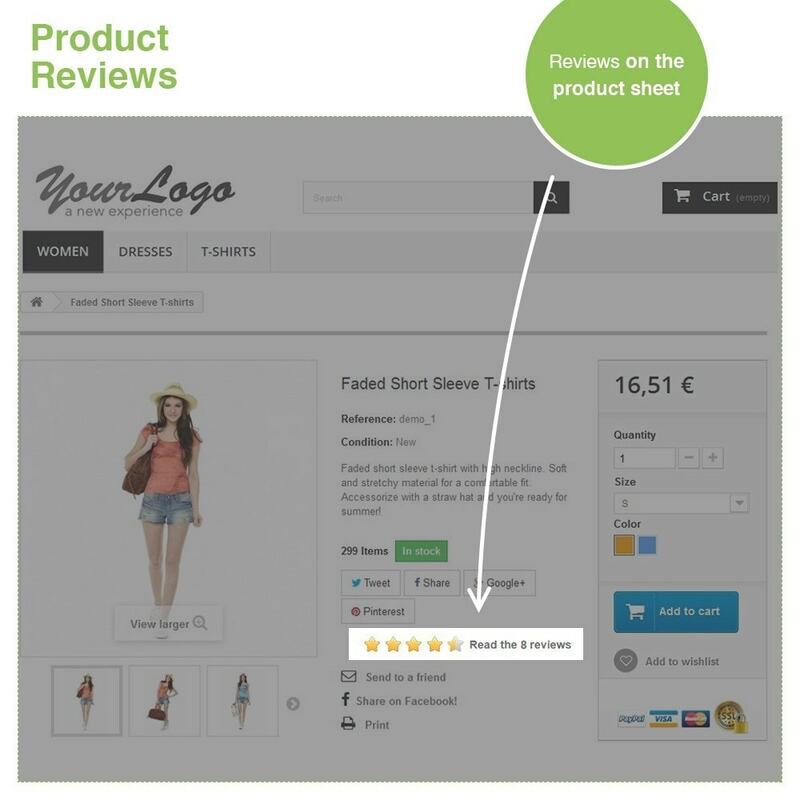 The module sends the opinion requests only to the customers who have made a purchase, only those who have made a purchase can review the store and the product (verified reviews) in order to avoid fake reviews. 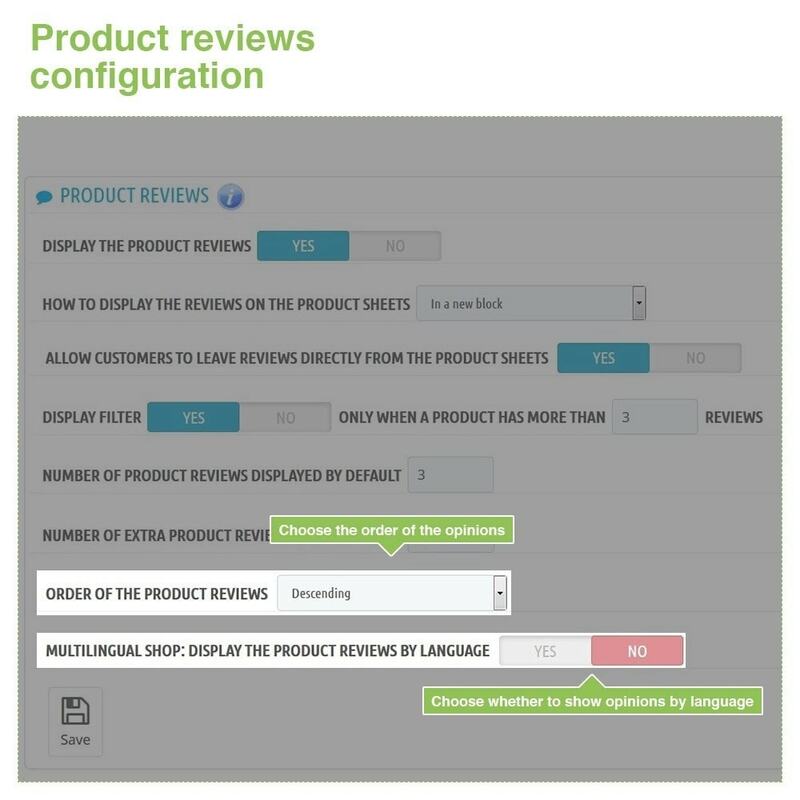 You can also enable an option in the module to allows users to leave a review directly from the front-office (store review page and product sheets). 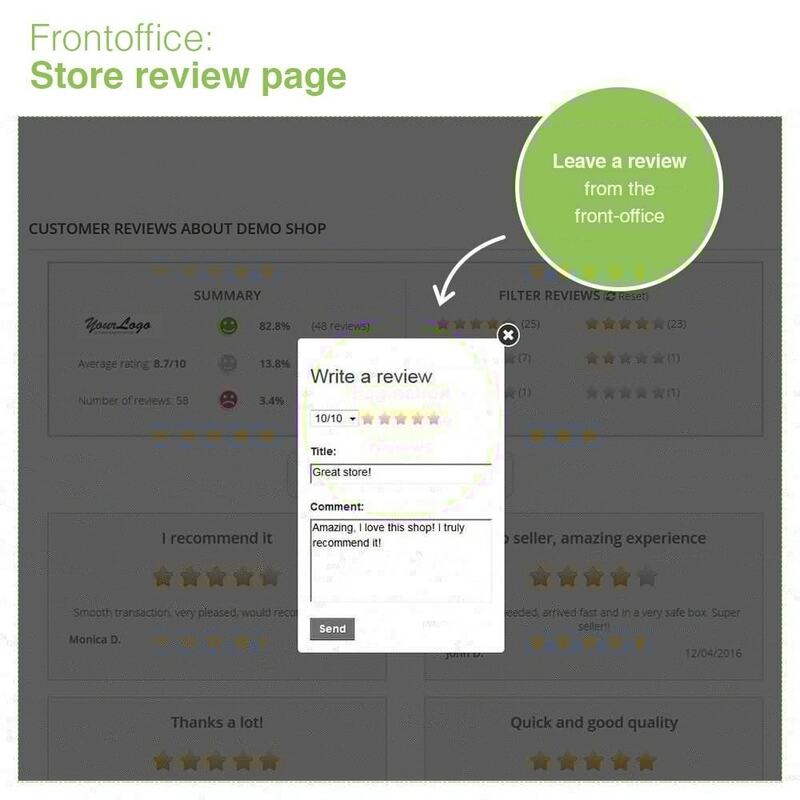 Users must be logged-in to be able to leave a review from the front-office. 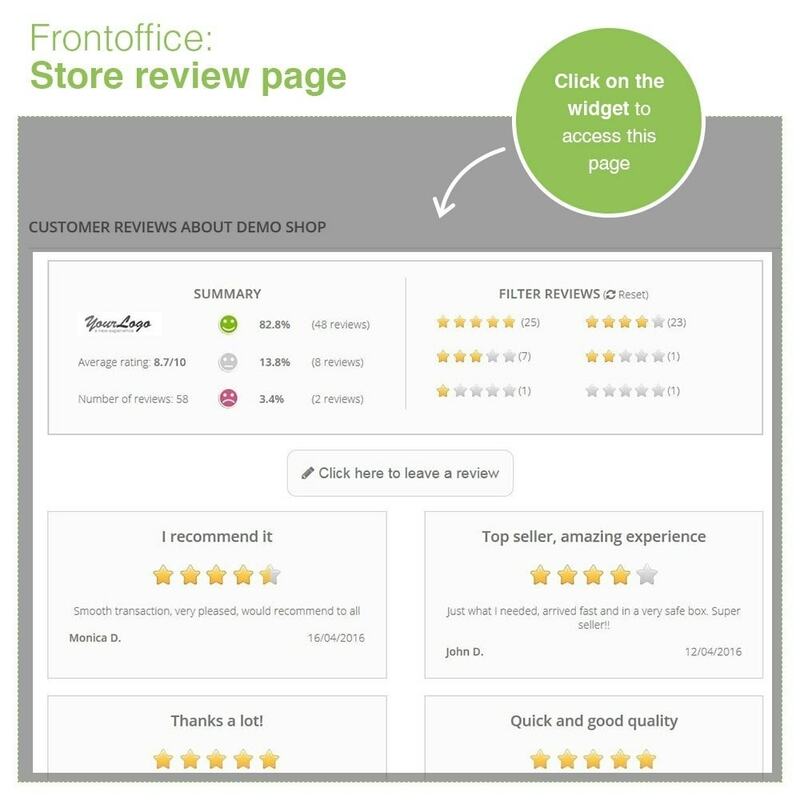 This widget contains a summary of the feedbacks received about your store and shows its average rating (stars) and a random comment. 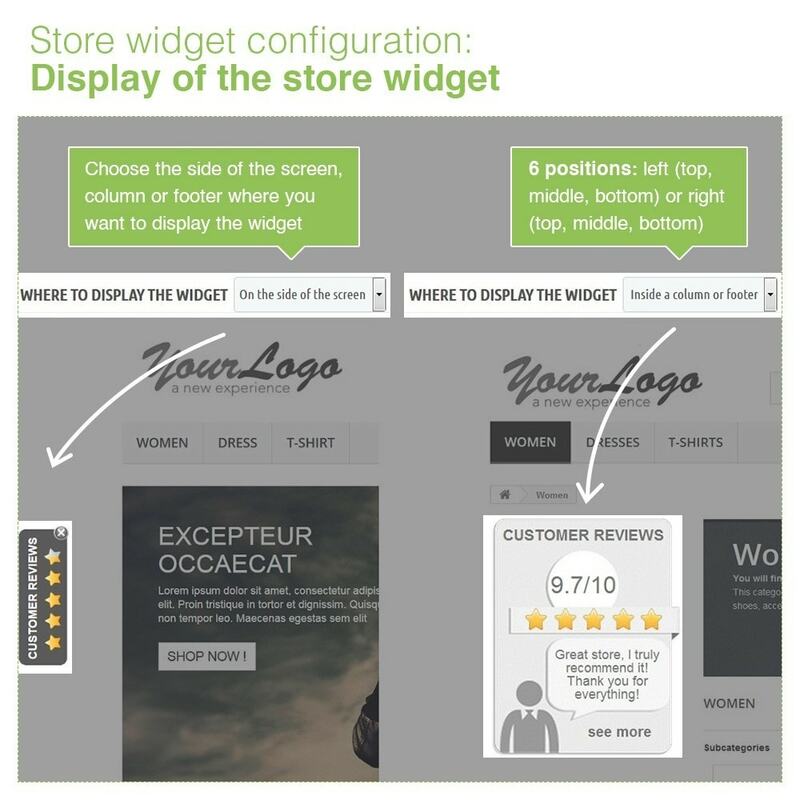 The link on the widget goes to a new page that contains all the reviews about your store. 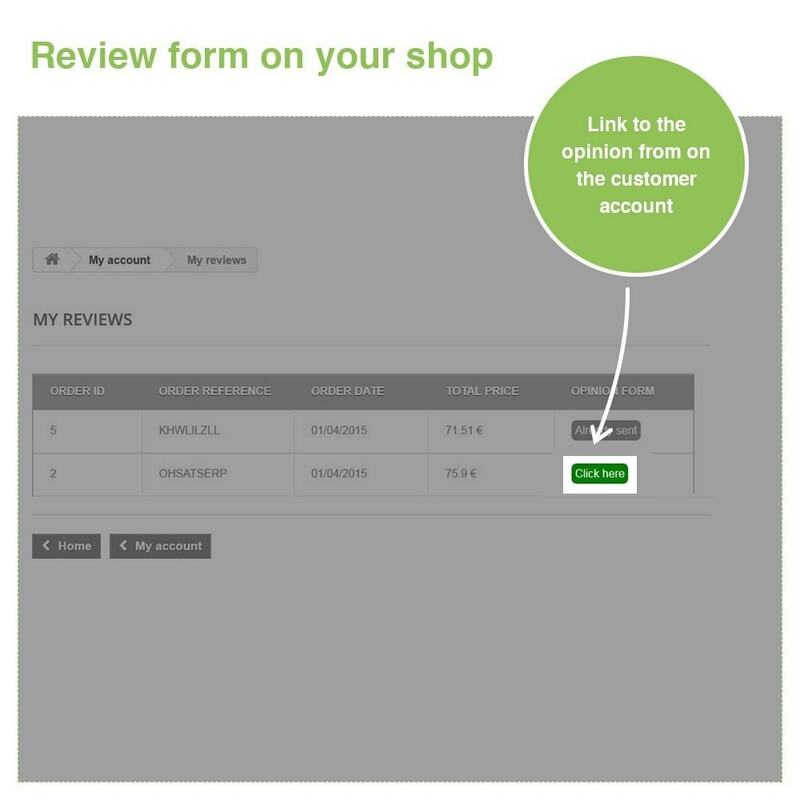 Each review is displayed in a block with its rating, title, comment, customer name and date. 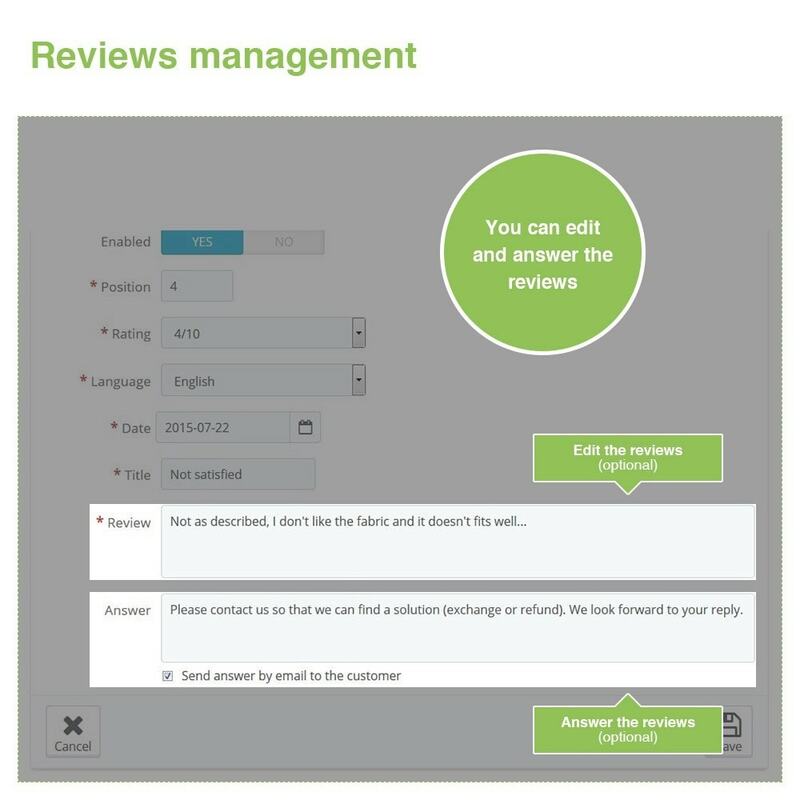 You also have an option to answer the review (the answer will be displayed just after the review and be visible by all users). 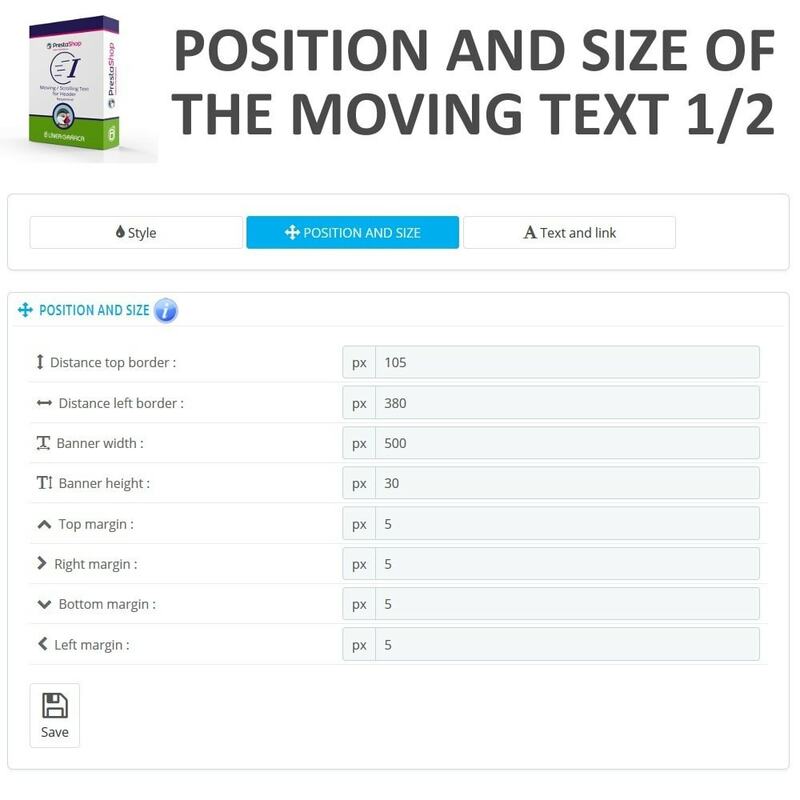 This page includes a pagination system and you can choose the number of reviews displayed by page in order to make the navigation easier for your customers. 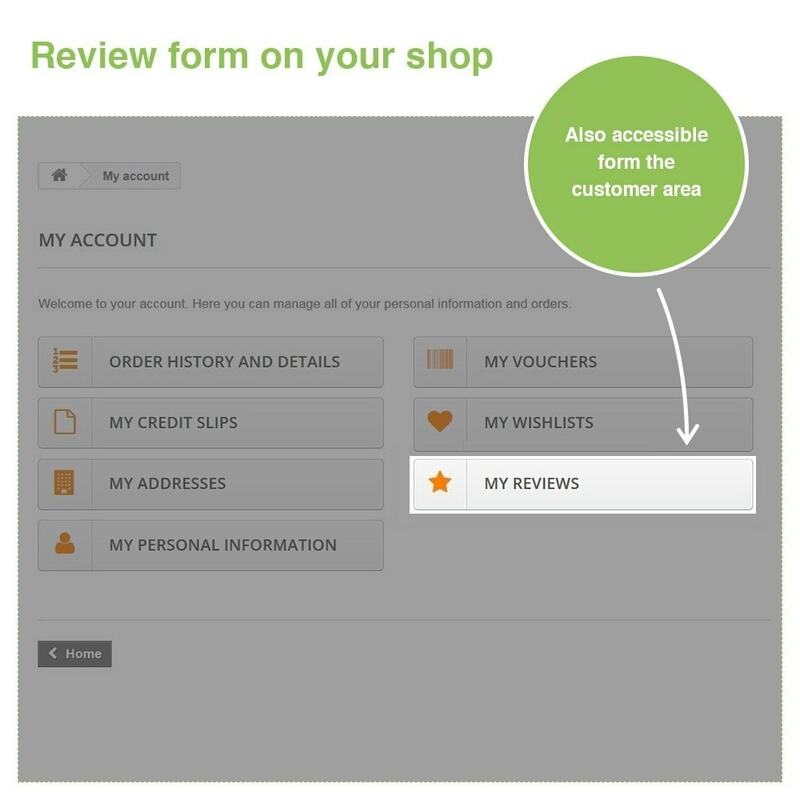 The module also includes on this page a block that contains a summary of the shop reviews and a rating filter so that your customers can sort out easily the shop reviews. 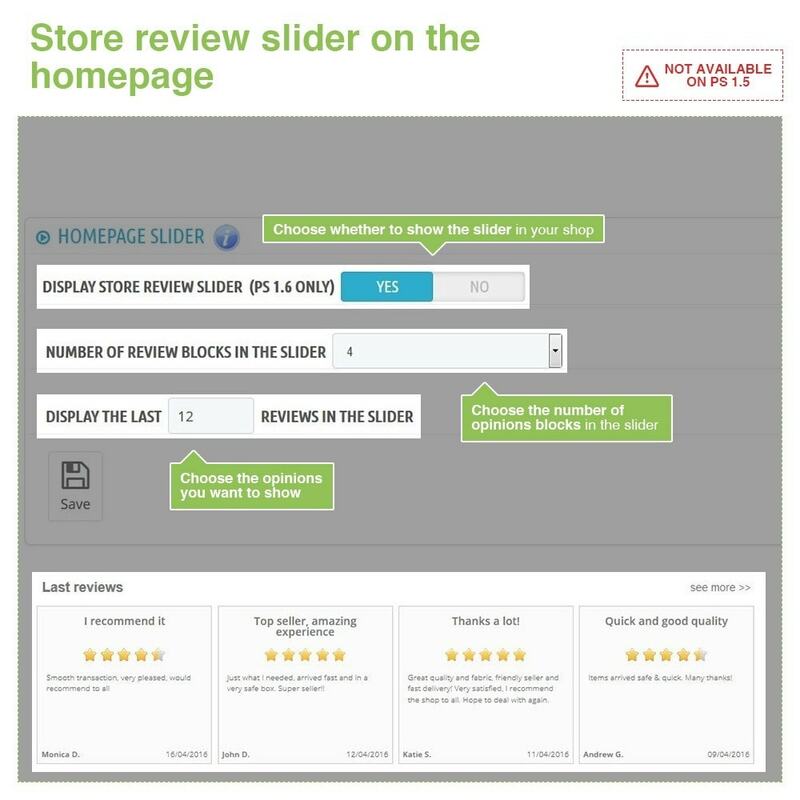 The module adds on the homepage a responsive slider (this feature is not available on PrestaShop 1.5) that contains the last store reviews with a link to the shop review page to see the rest of the reviews. 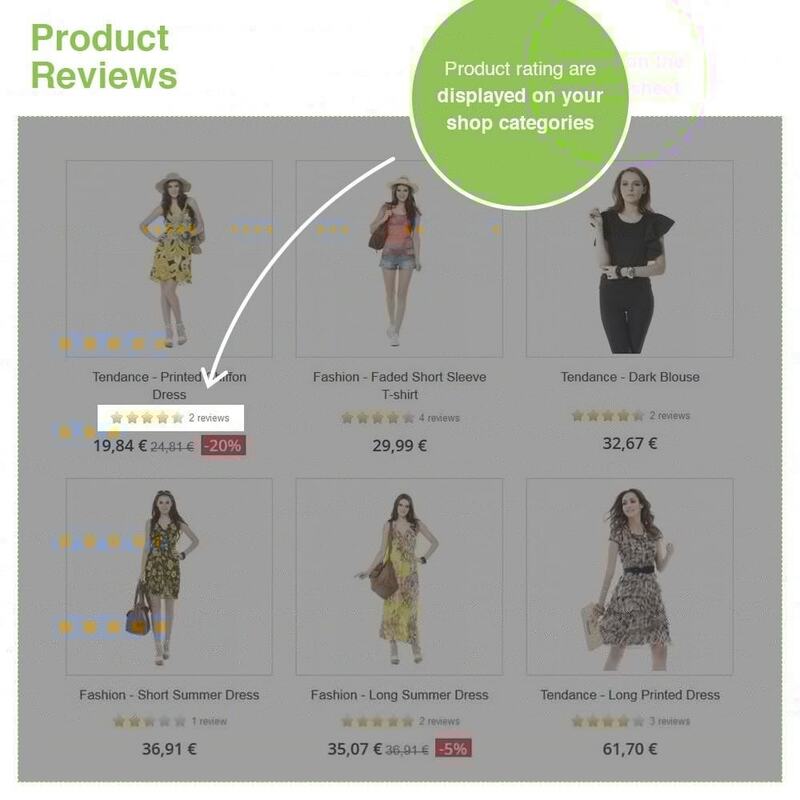 the average rating (stars) and the number of reviews per product on the product list of your categories and subcategories. 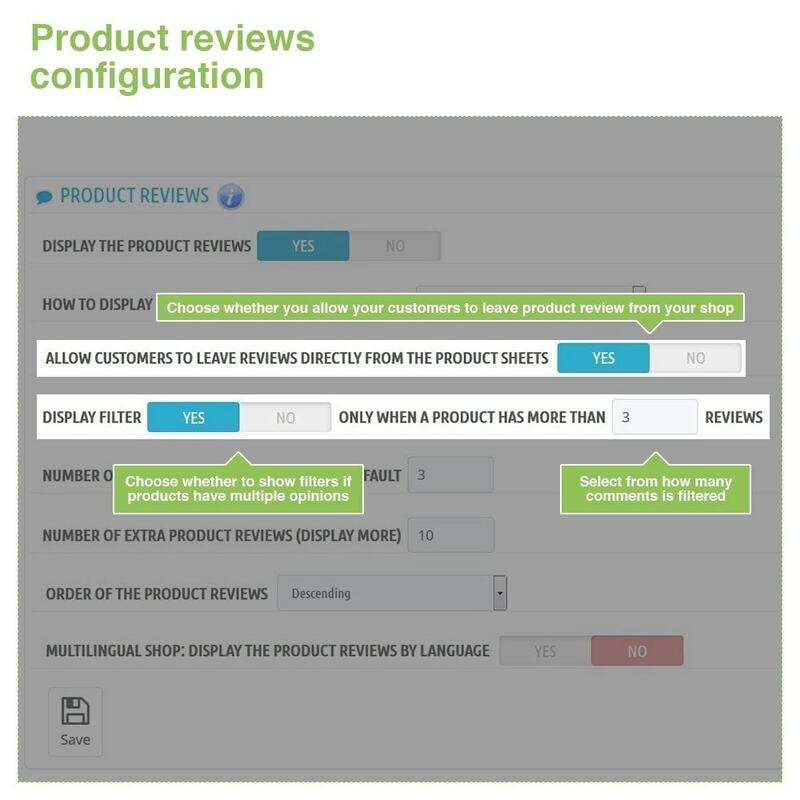 the average rating (stars) and the number of reviews on the superior part of the product sheet with a link "Read the x reviews" that automatically goes to the review section. 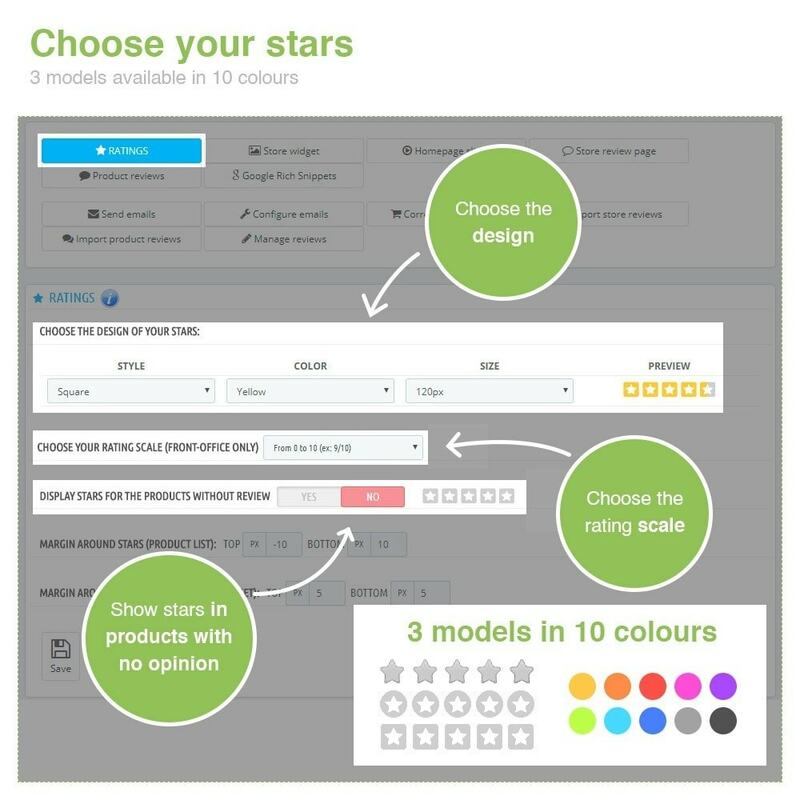 The module includes on the product sheets a rating filter so that your customers can sort out easily the reviews of each product. 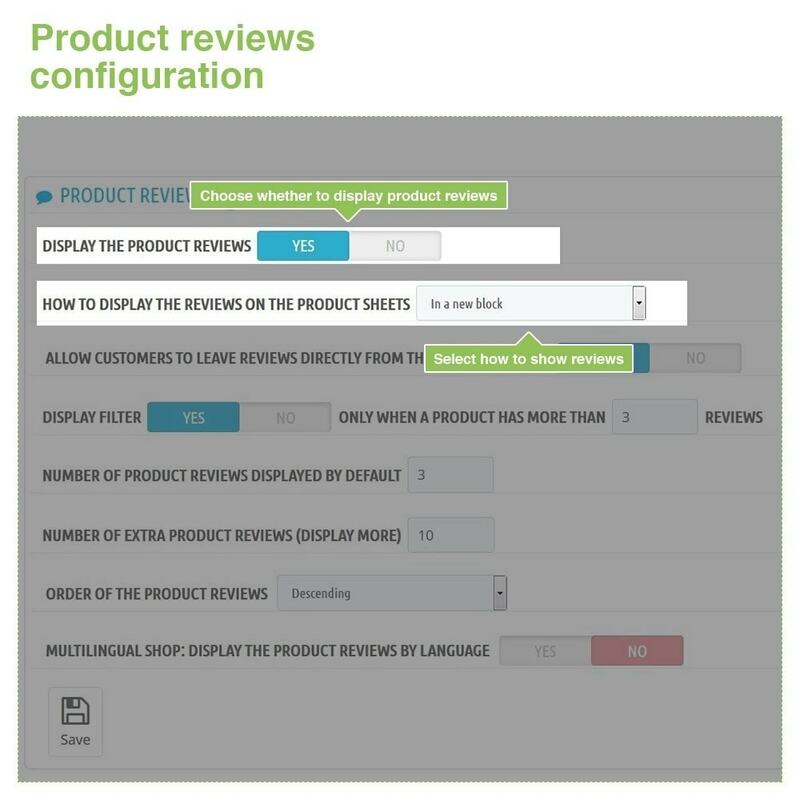 The module also includes a “See more” option: you can choose the number of reviews displayed by default on the product sheets and the number of extra reviews to display when clicking on the button “See more” in order to make the navigation easier for your customers. 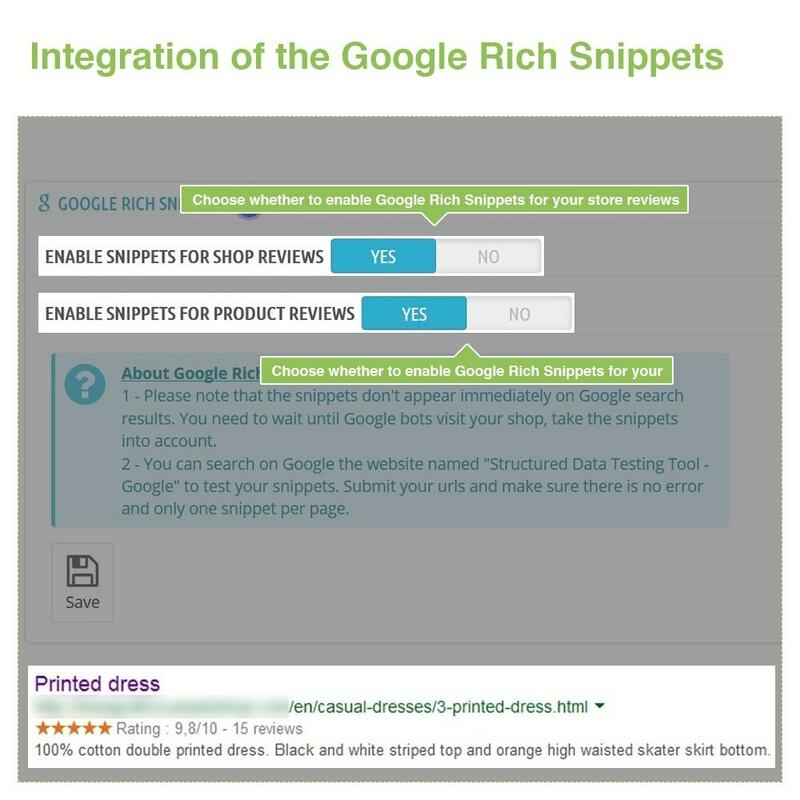 Google Rich Snippets allows you to differentiate your store and products from all the other stores and attract customers' attention. 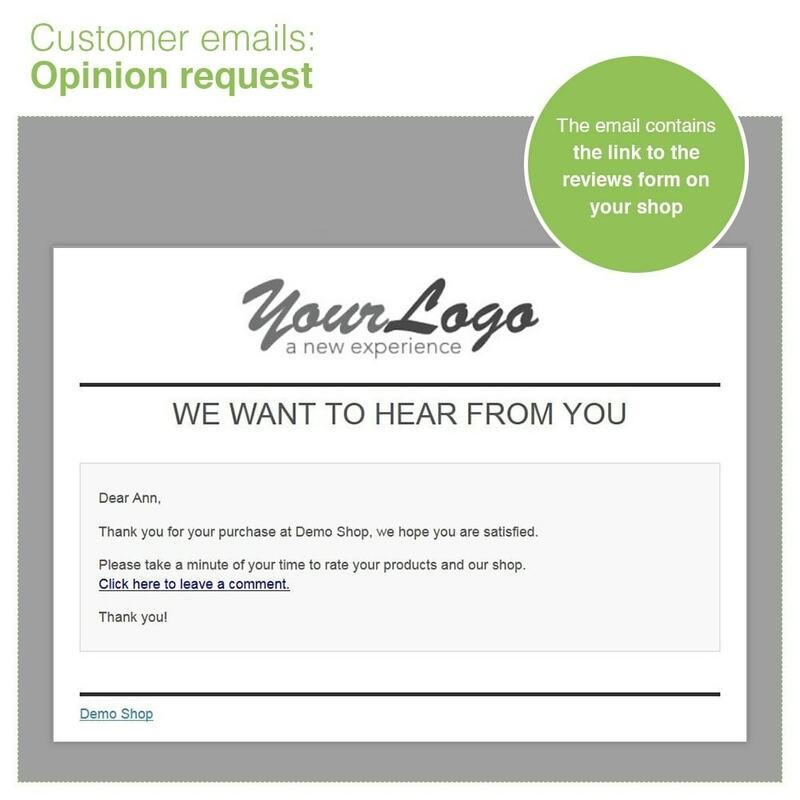 The module sends an email to your customers (those who have made a purchase only) to request their opinion. 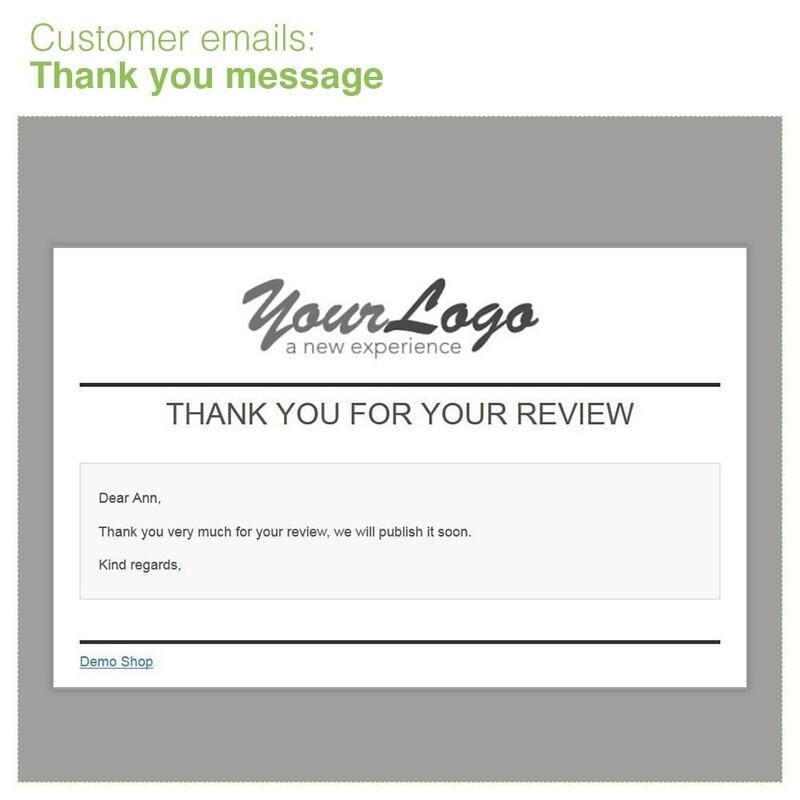 The link inside the email sends them to a form on your shop that allows them to leave a feedback (rating + title + comment) about the store and each one of the product purchased. 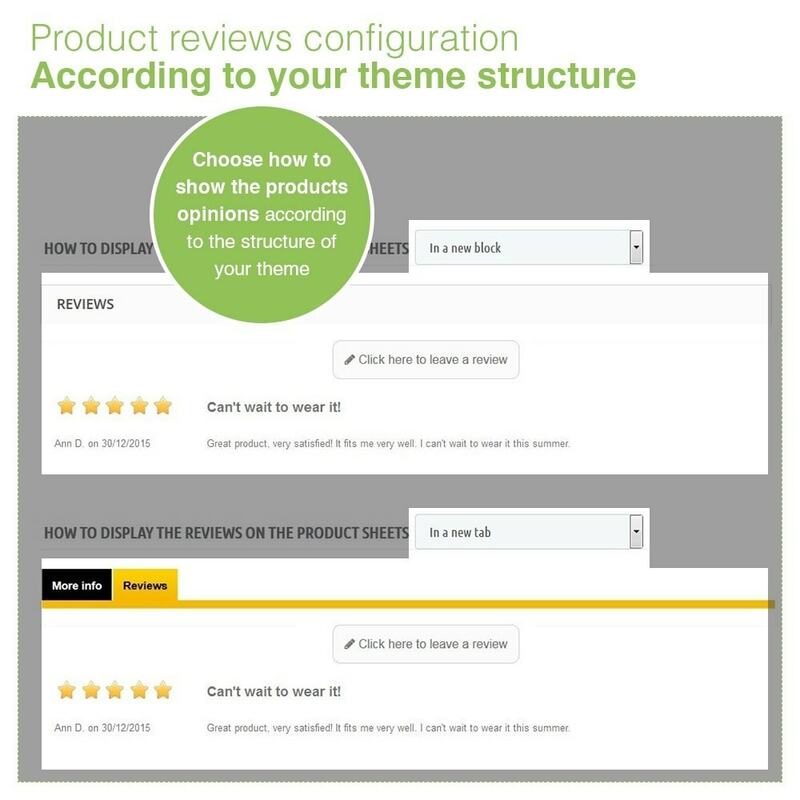 The link is also available from their customer area (the module adds a new section "My reviews"). 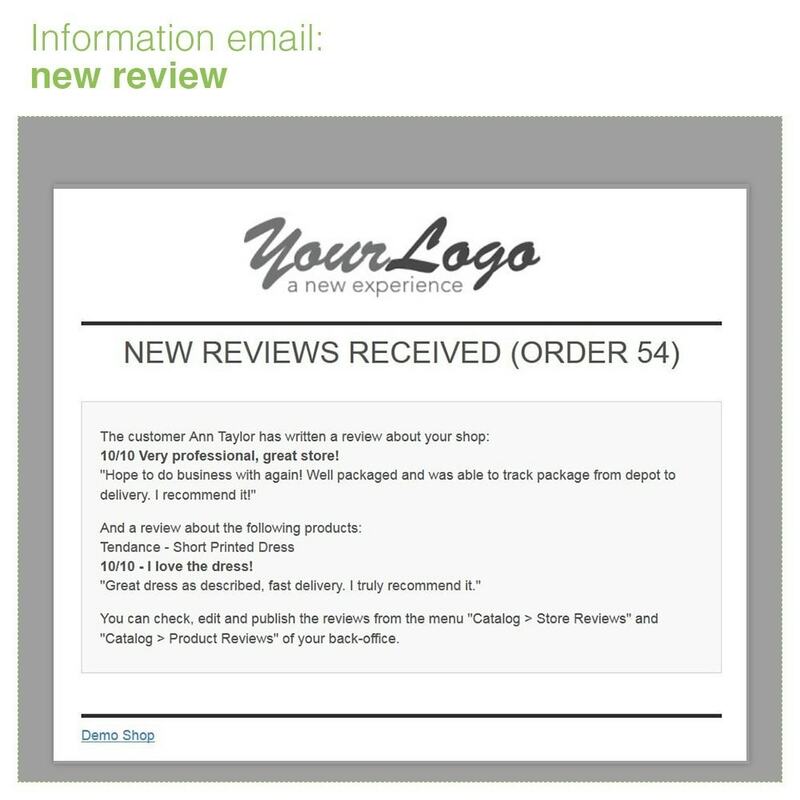 You can also choose the type of reviews your customers can write (shop and product reviews OR shop reviews only OR product reviews only). 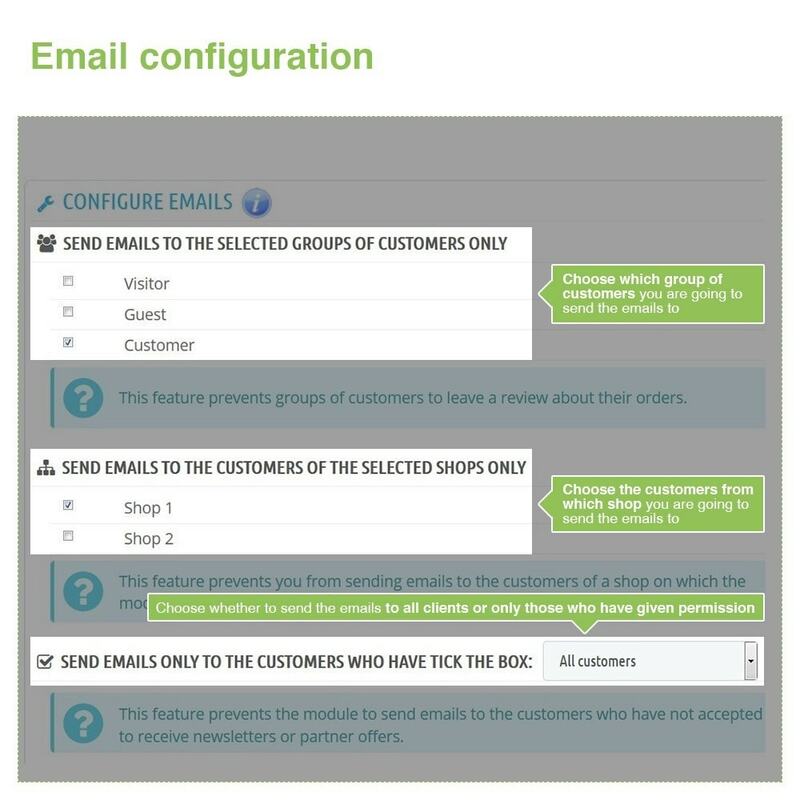 You need to configure the 5 criteria: the module will send emails only to the orders that correspond to the selected dates AND selected order status AND selected customer groups AND selected shops AND selected newsletters and opti-in option. 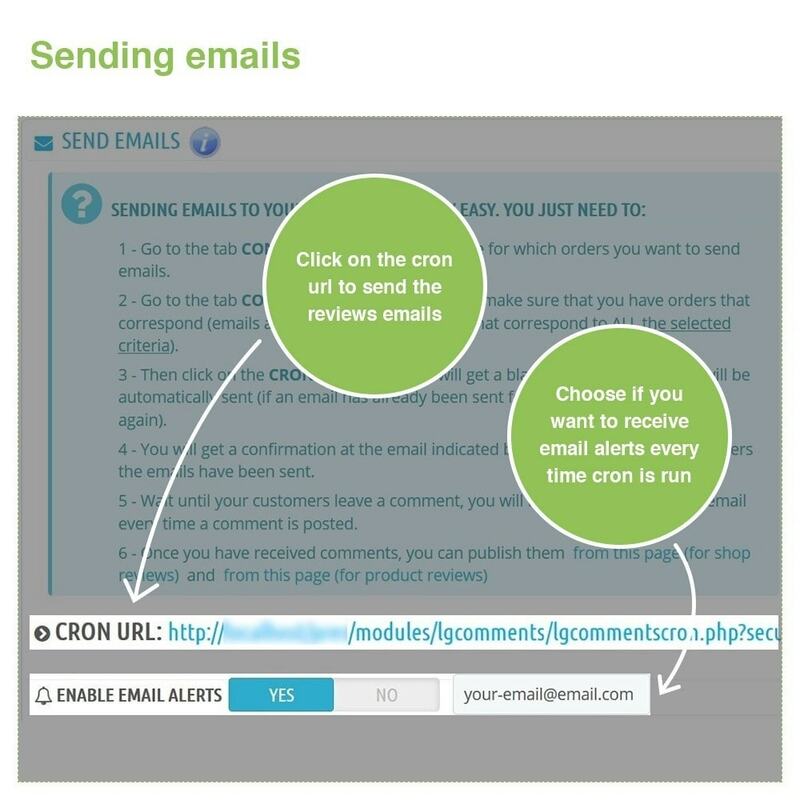 You only need to execute the URL of the cron (provided inside of the module) to send the request of opinion automatically by email to your customers. 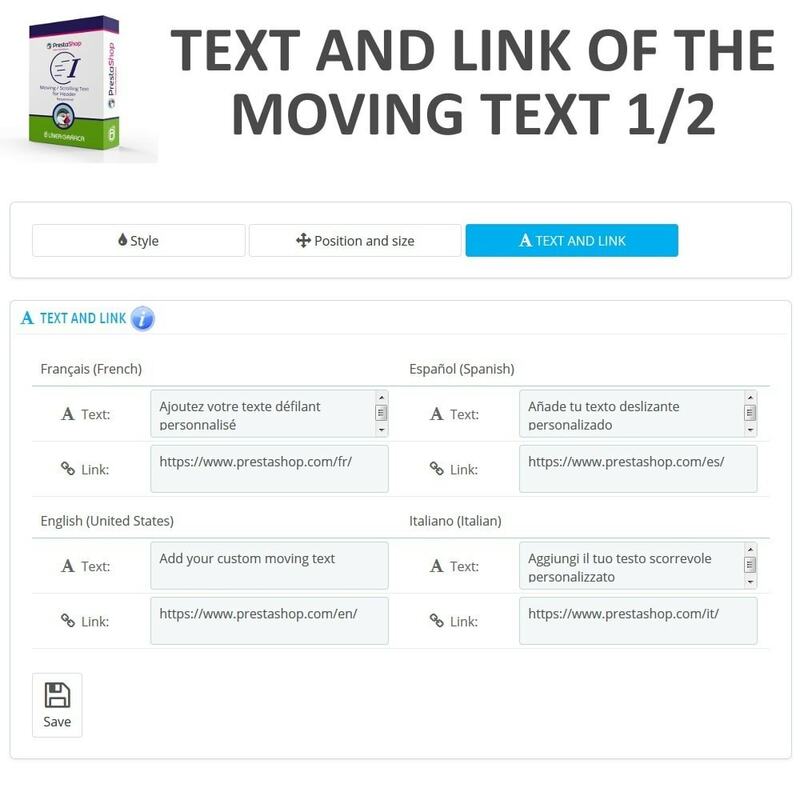 You can either execute the cron manually copying/pasting the URL inside of the URL bar of your browser or execute it automatically at regular intervals using a free cron module. 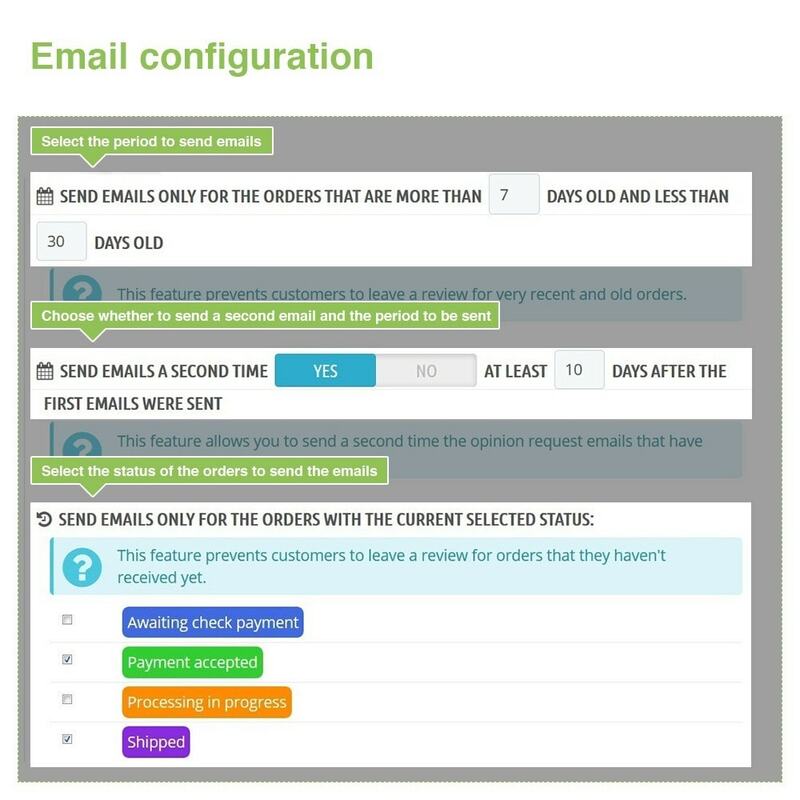 Emails can only be sent twice for each order, and you can choose the mininum number of days between the two emails. 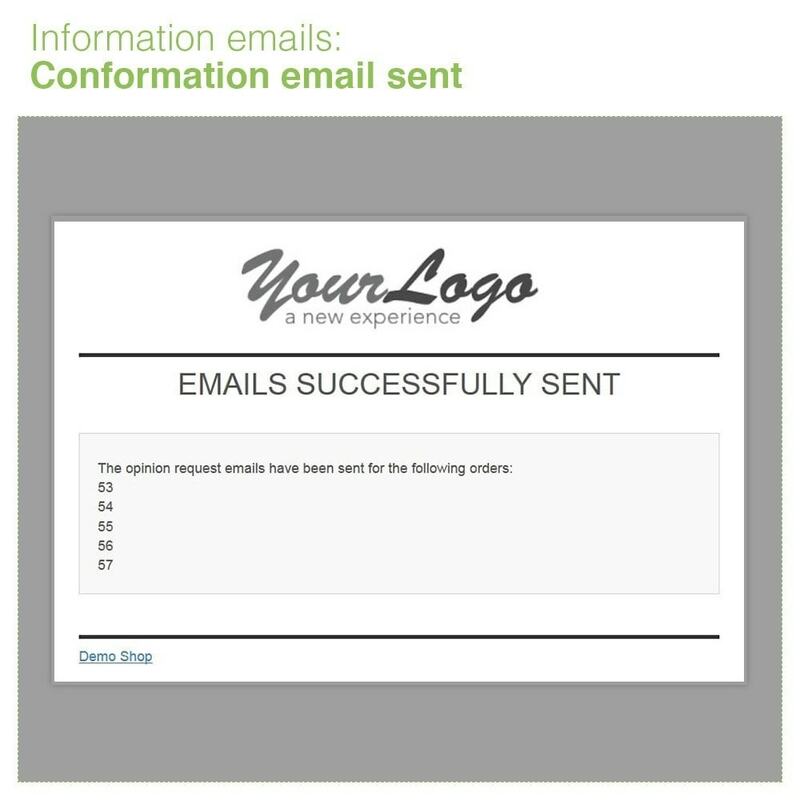 If a customer writes a comment after receiving the first email, the second email won't be sent. 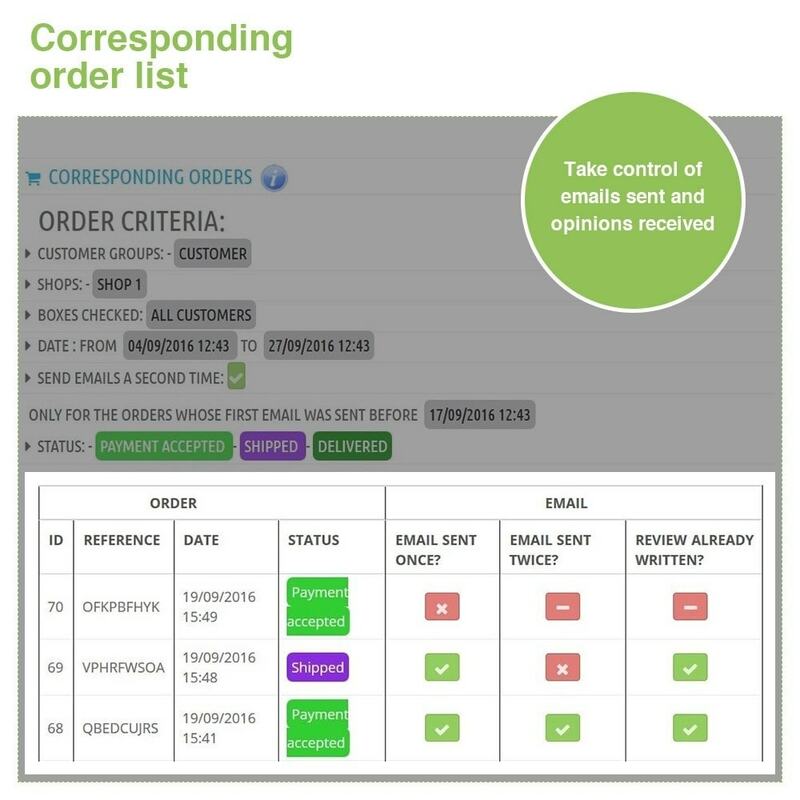 The module also includes a page that shows all the orders that correspond to the currently selected dates, order status and customer groups and shows if the emails have already been sent or not and if customers have already written a review or not. 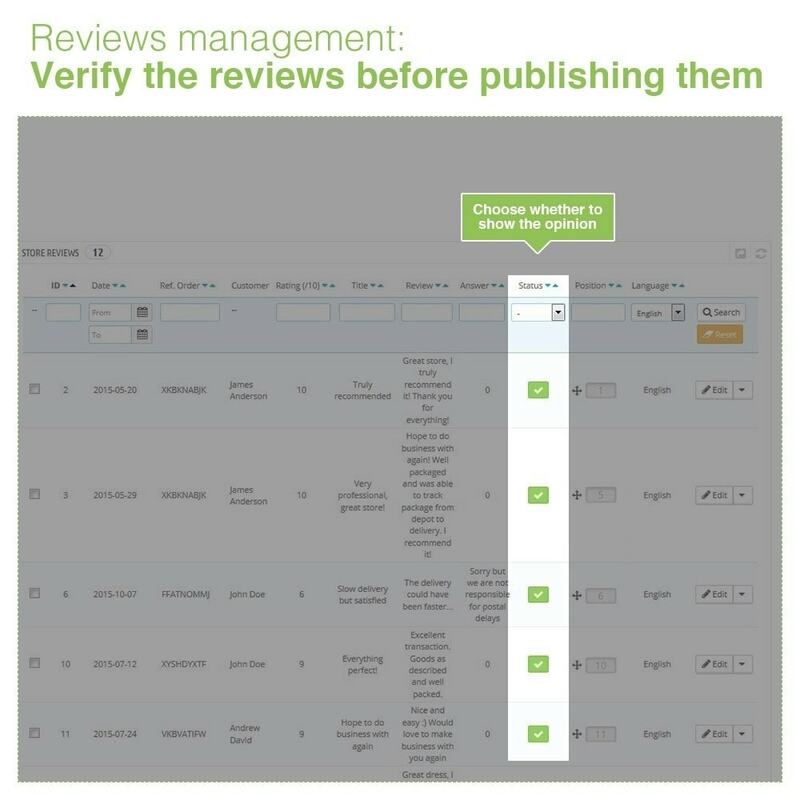 You will receive an email to inform you every time that a review is written (desactivated by default). 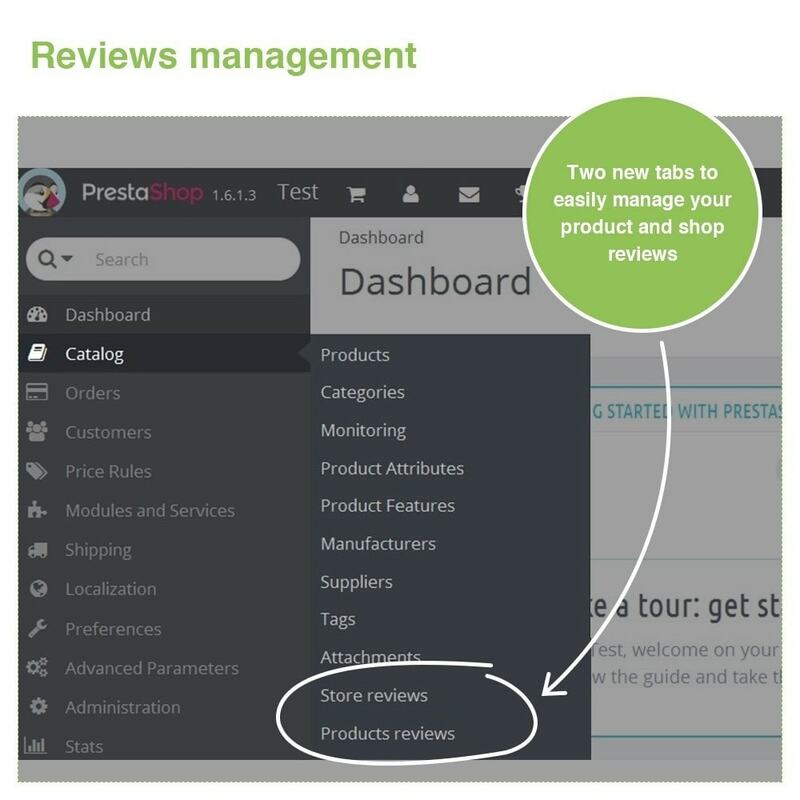 You just need to go to the two new tabs "Catalog > Store reviews" and "Catalog> Product reviews" created by our module in your back-office to manage the reviews you have received and publish them. 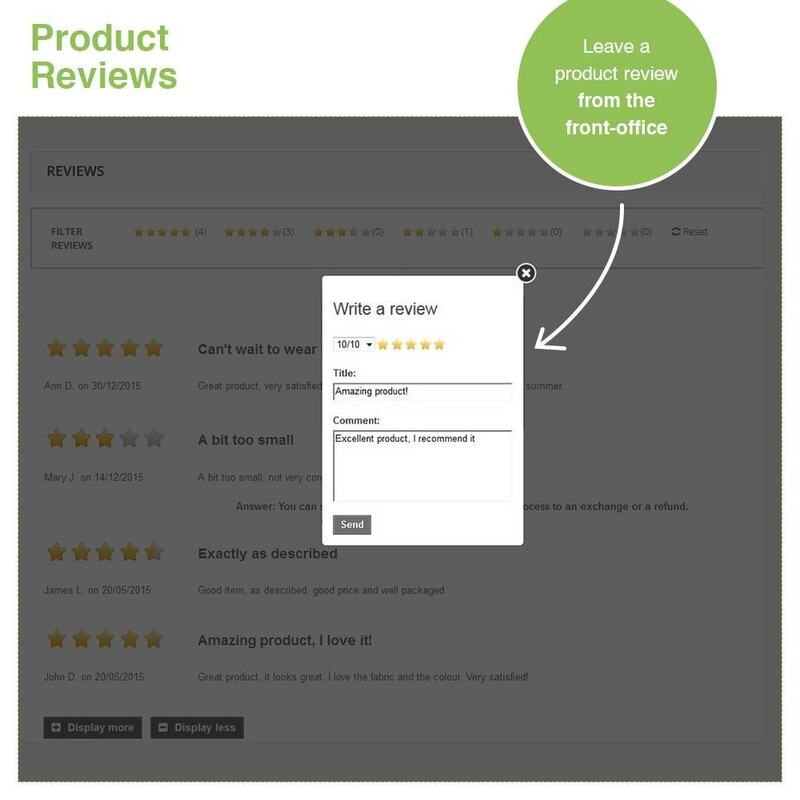 The module contains two file uploaders to help you upload your old reviews: one uploader for product reviews and another one for store reviews. 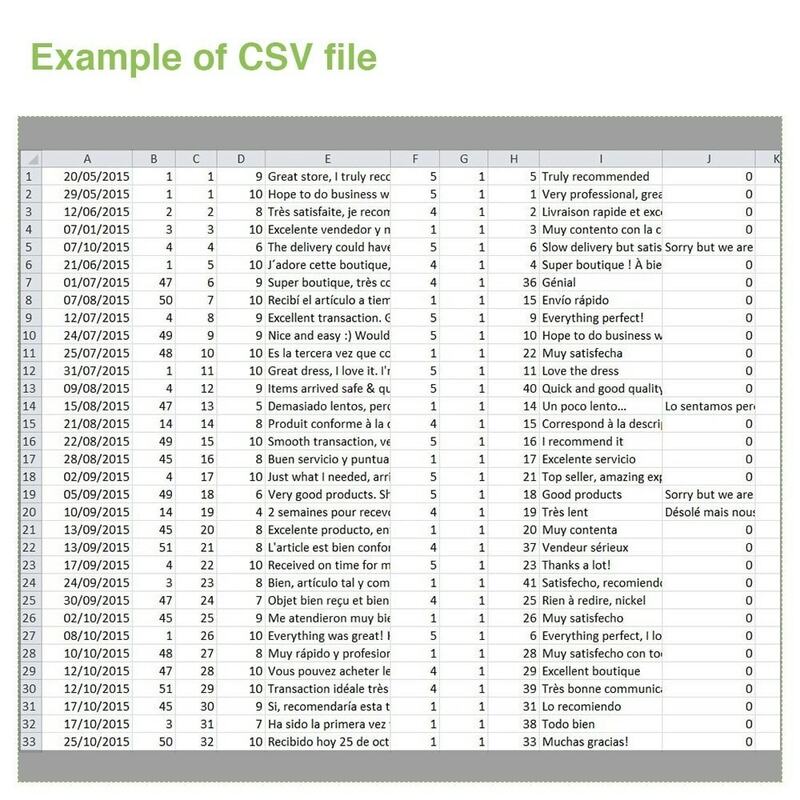 To upload your old reviews, you just need to copy your reviews inside a CSV file (one file for the product review and one file for the store reviews) respecting the instructions inside the module and then upload the CSV file via the uploader. 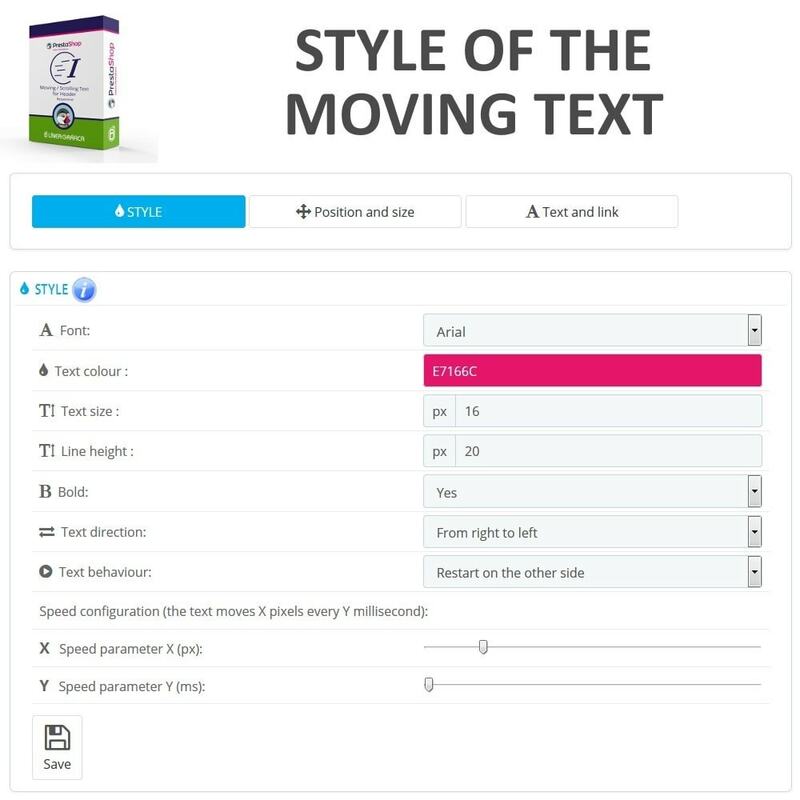 All the comments will be added inside the module and displayed in the front-office. We have also added a feature to export the existing store and product reviews from our module in CSV file in order to be able to create a save easily. 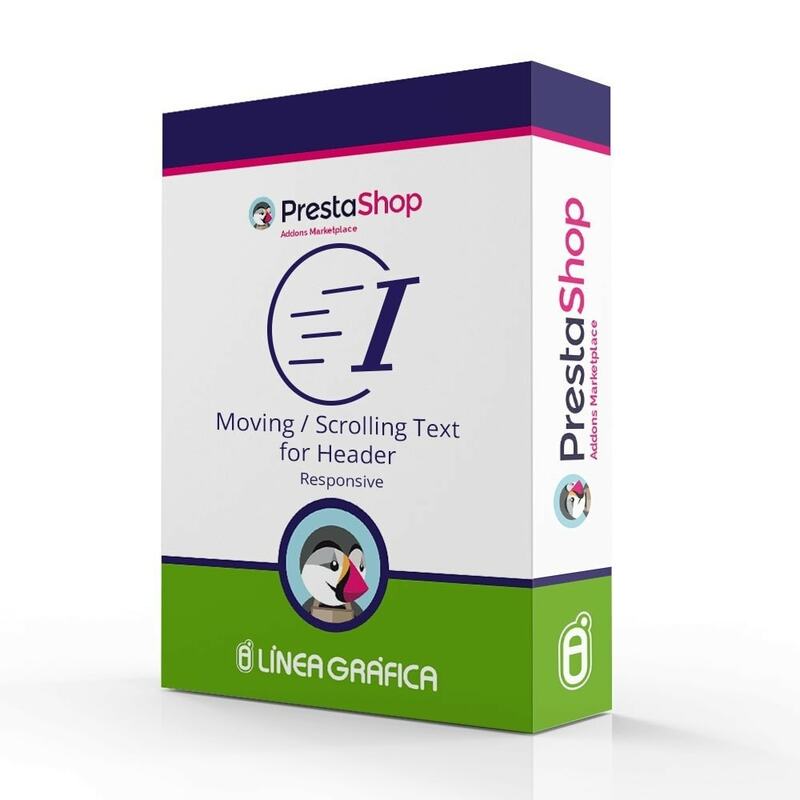 The module is compatible with PrestaShop multistore and can be used on your different shops but please note that the store and product comments are common to all shops and visible on all of them. 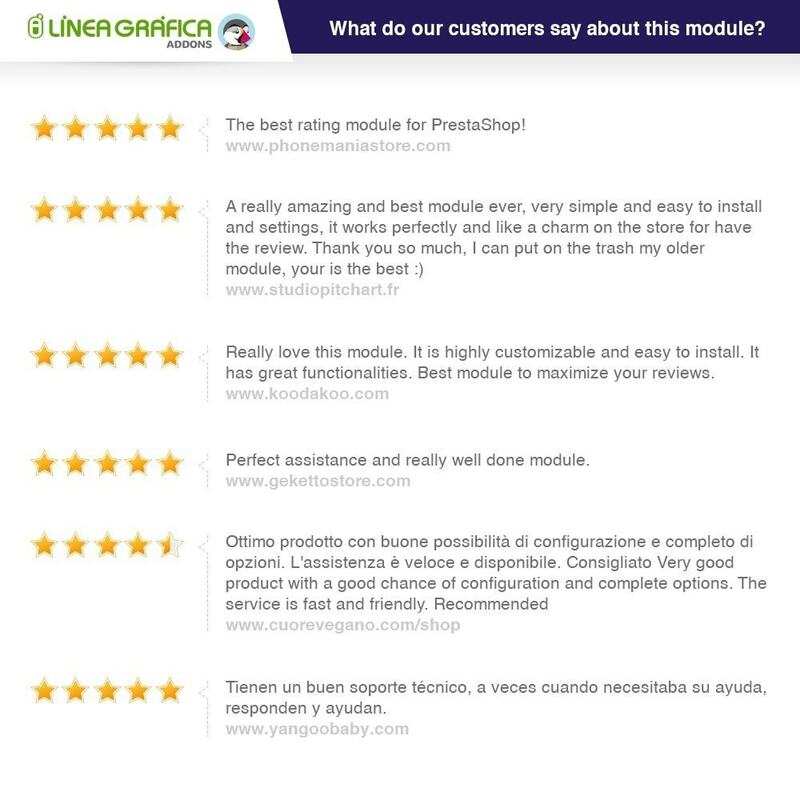 Can I use your module along with PrestaShop native module "Product Comments" (productcomments)? 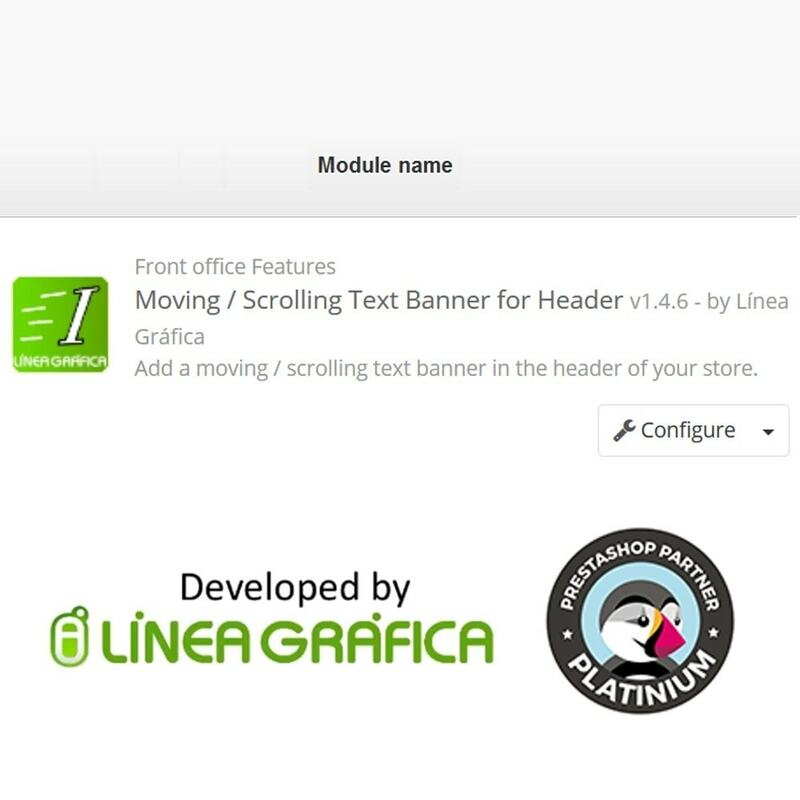 Both modules are independent, so yes you can use both of them at the same time, but it's better to avoid having 2 different and separate comment systems on your shop. 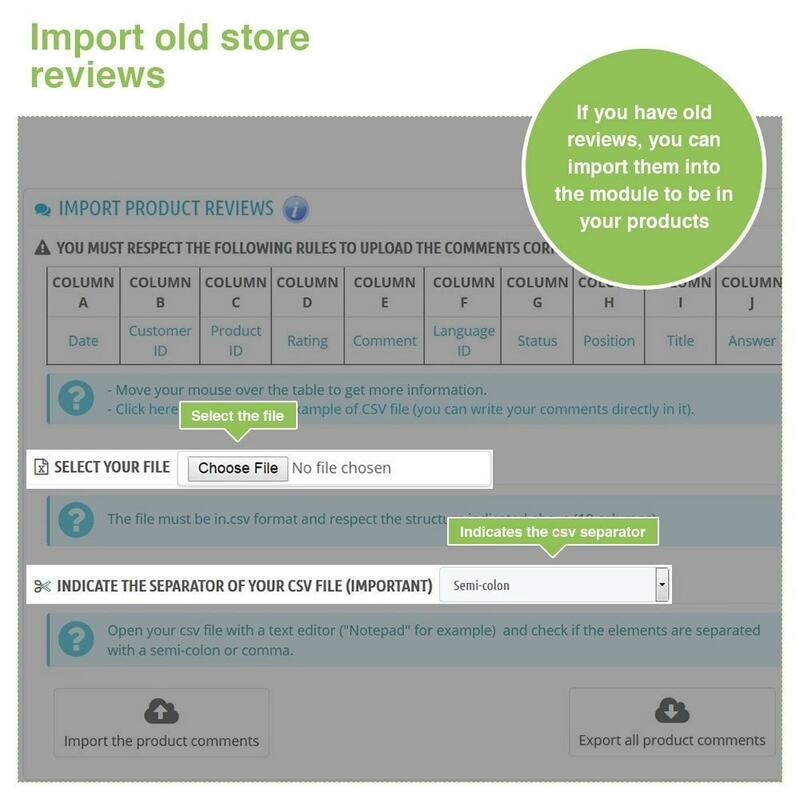 You can hide the product comments collected by our module (the module will ask customers for their opinion about the shop and products but won't display the product comments) or you can import the product comments from the PrestaShop module to our module using our CSV import system. 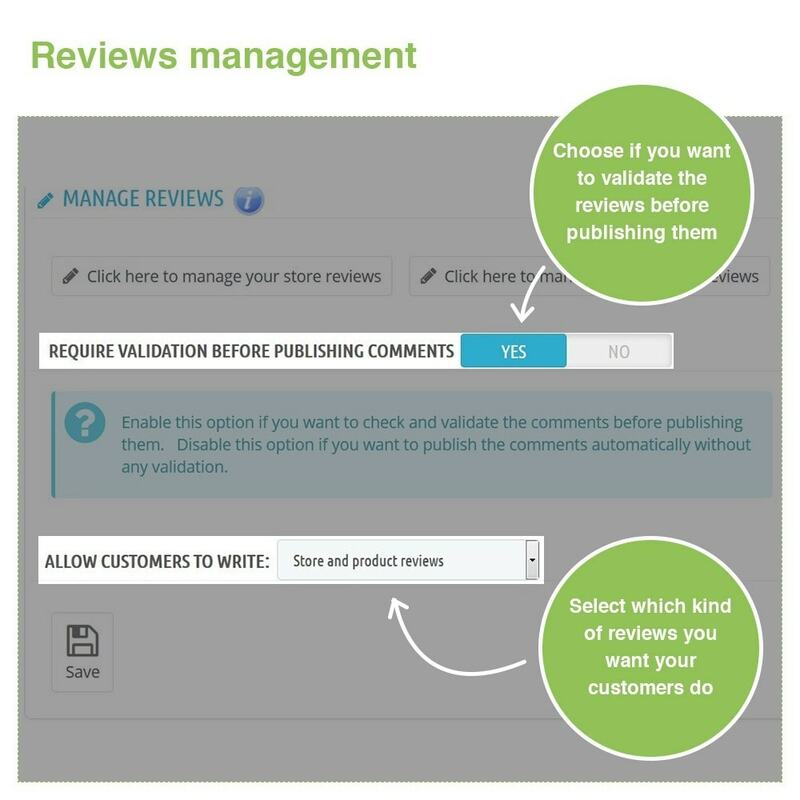 Does the module include a discount code system to encourage people to write a review? 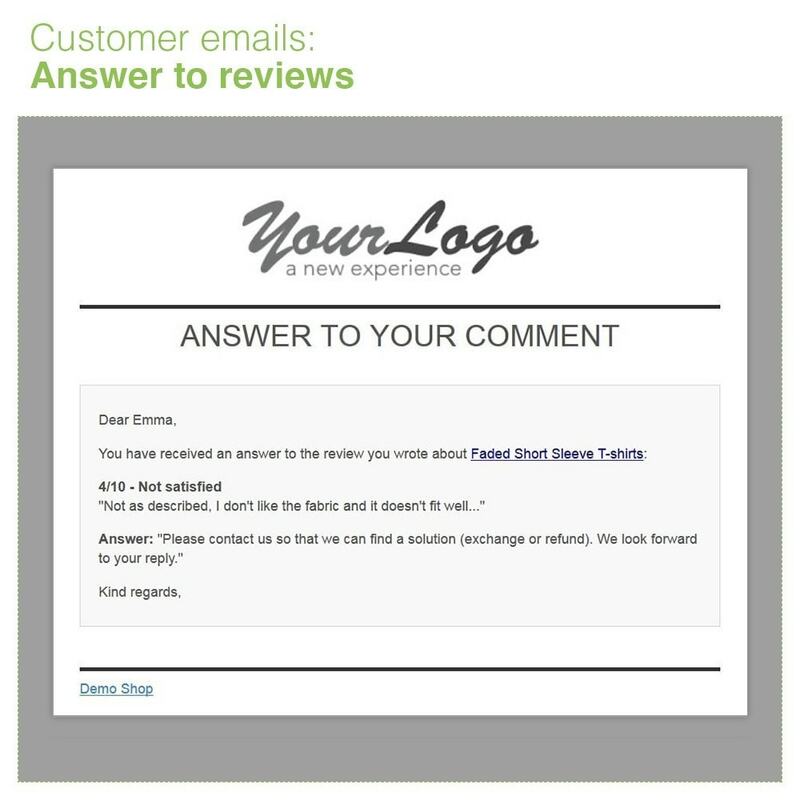 No, our module does NOT include such feature, but you can add a discount code manually into the "thank you" email that is sent to customers just after they have left a review. Do I have to pay any subscription to use the module? No, all the services included are free without any limits of time or amount or orders. The only thing you have to pay is the module price. 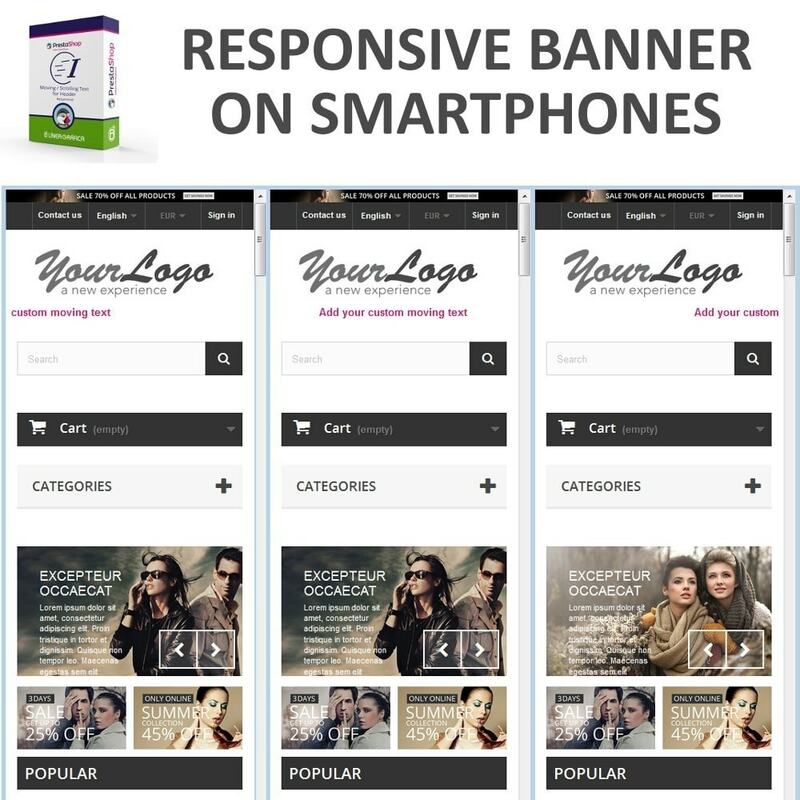 It's a very good product for your e-shop & customers . 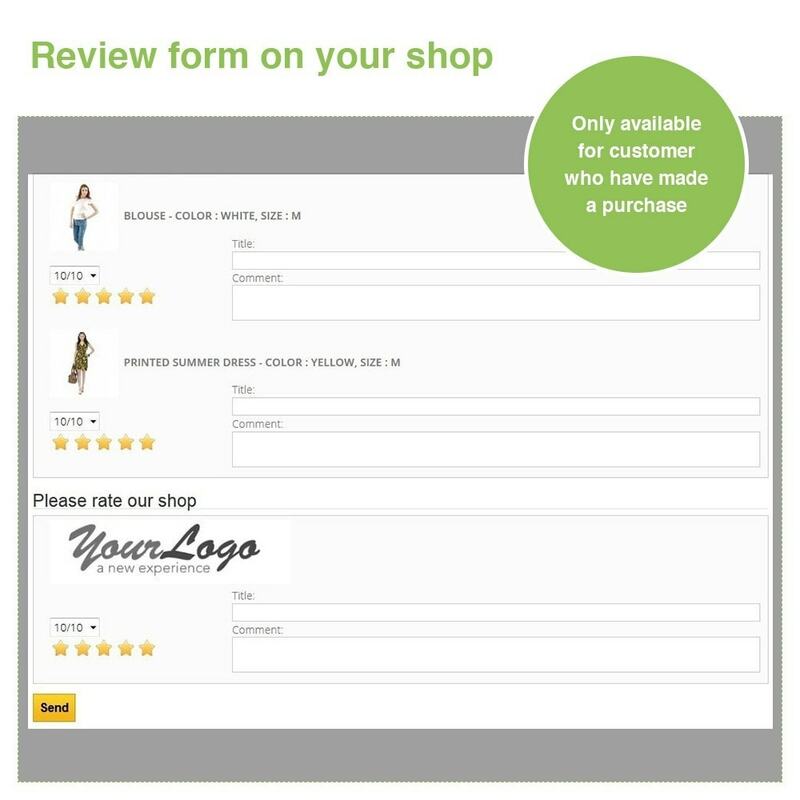 Yours customers have real informations about your shop and the product from your shop from other customers . You can reply also to them and manage what they said . 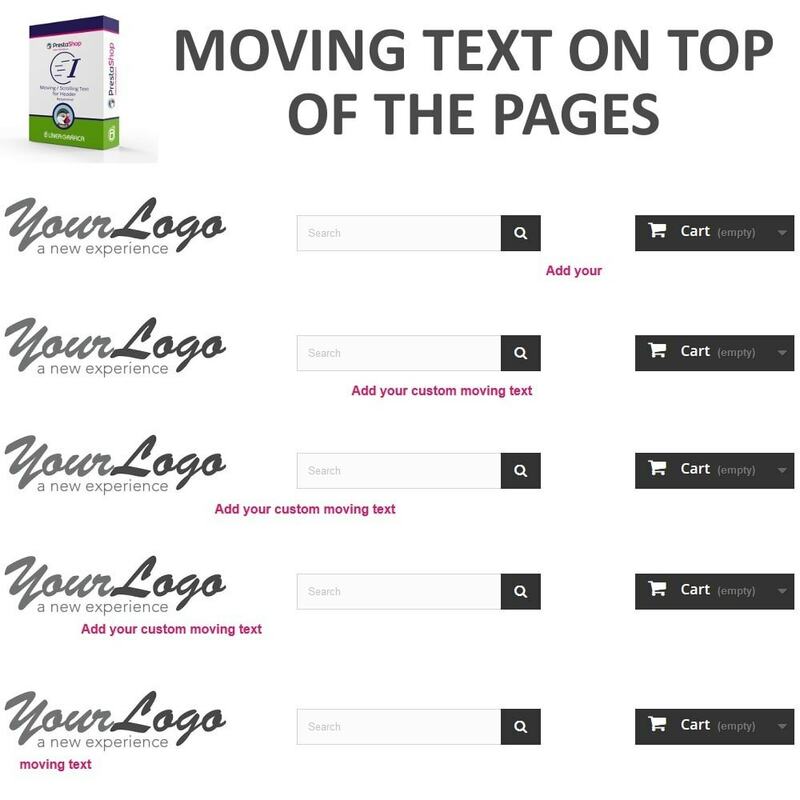 Excellent product, without external services, you configure and install it easily. Fast and professional technical support. Highly recommended !!!!!!!! 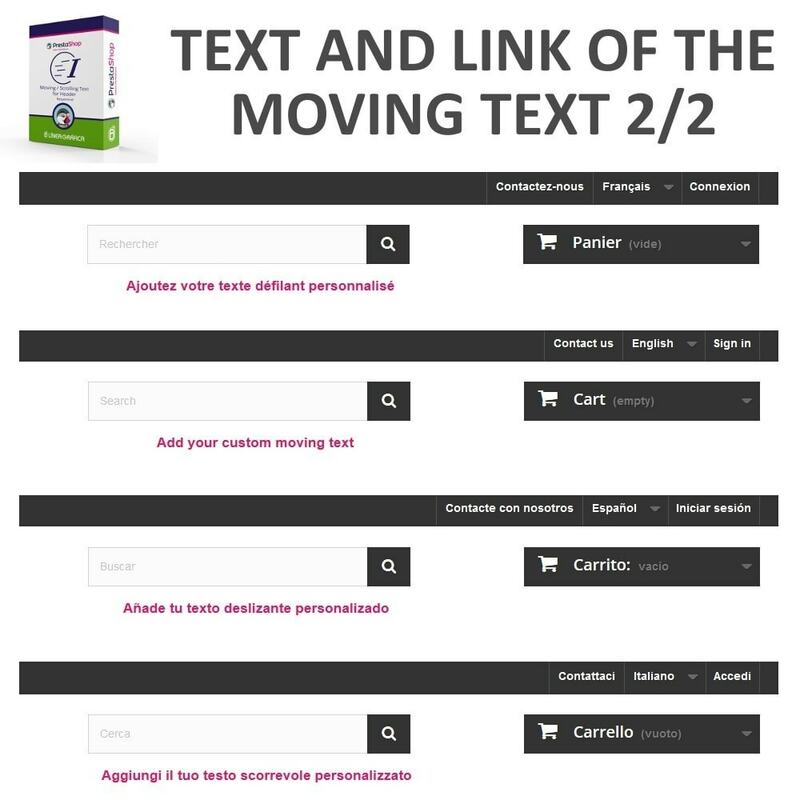 This module allows you to give a chance to speak to your customers in order to know their opinion, to increase their trust thanks to the opinion of other customers and attract their attention more easily, especially with the Google Rich Snippets system that allows you to optimize the visibility of your products on Google. 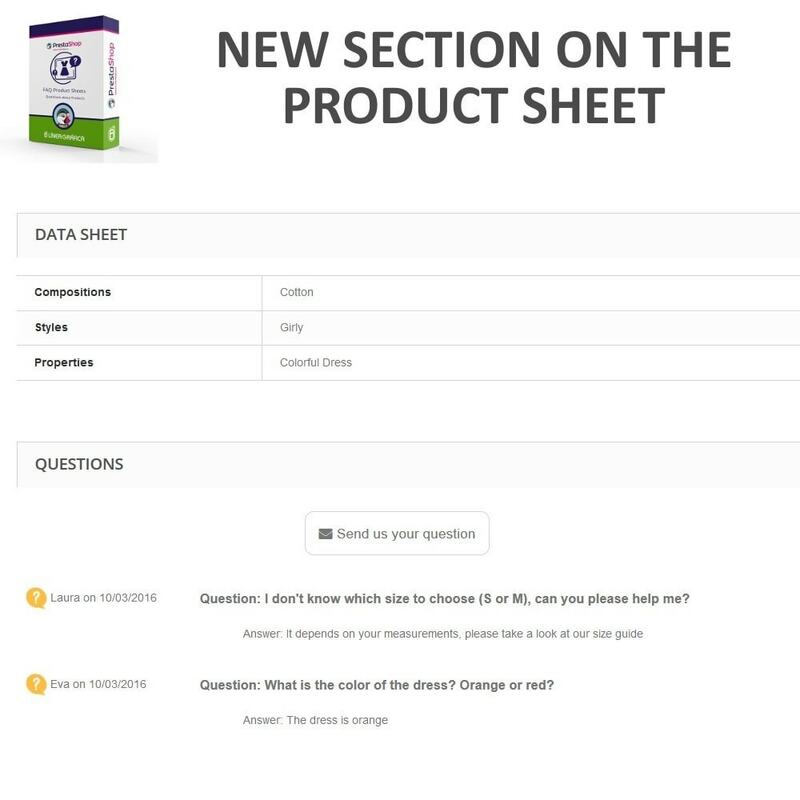 Thanks to our module, customers can now ask questions about your products directly from the corresponding product sheets (every question/answer is specific to a product, each product has its own questions/answers, as on Amazon.com website). 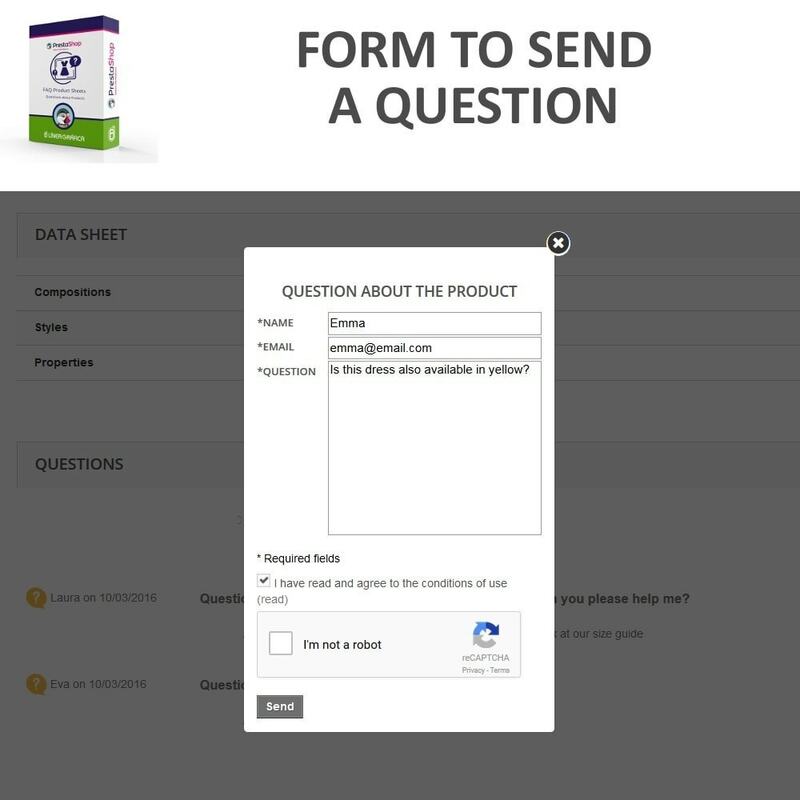 The module adds a new section to each product sheet with the existing questions/answers and a form that allows customers to send their questions (pop-up window with the following fields : "Name", "Email" and "Question"). 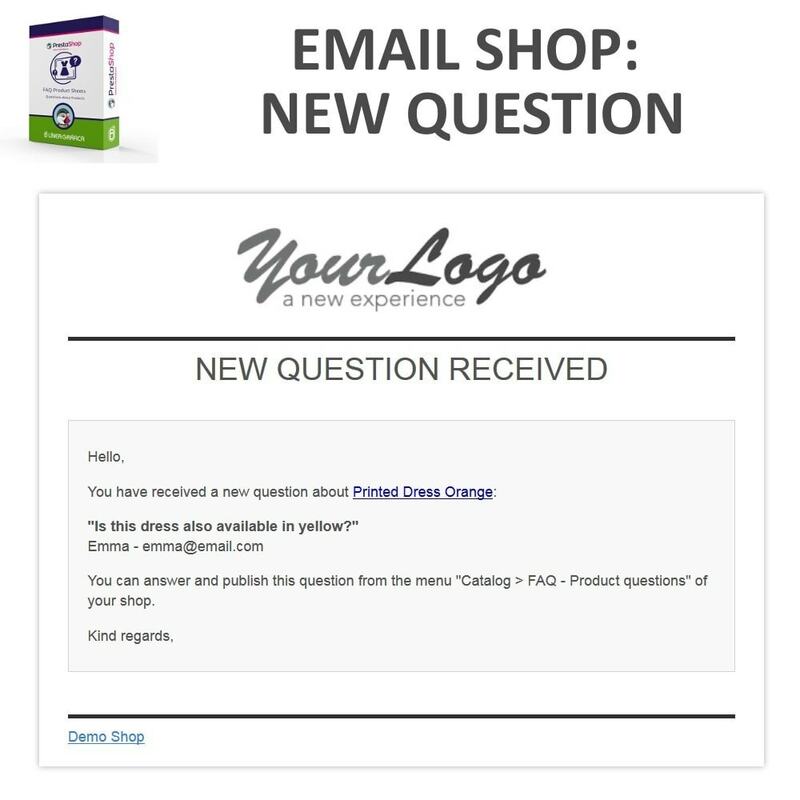 When a customer asks a question about as product, you automatically receive an email that informs you of the question you have received. 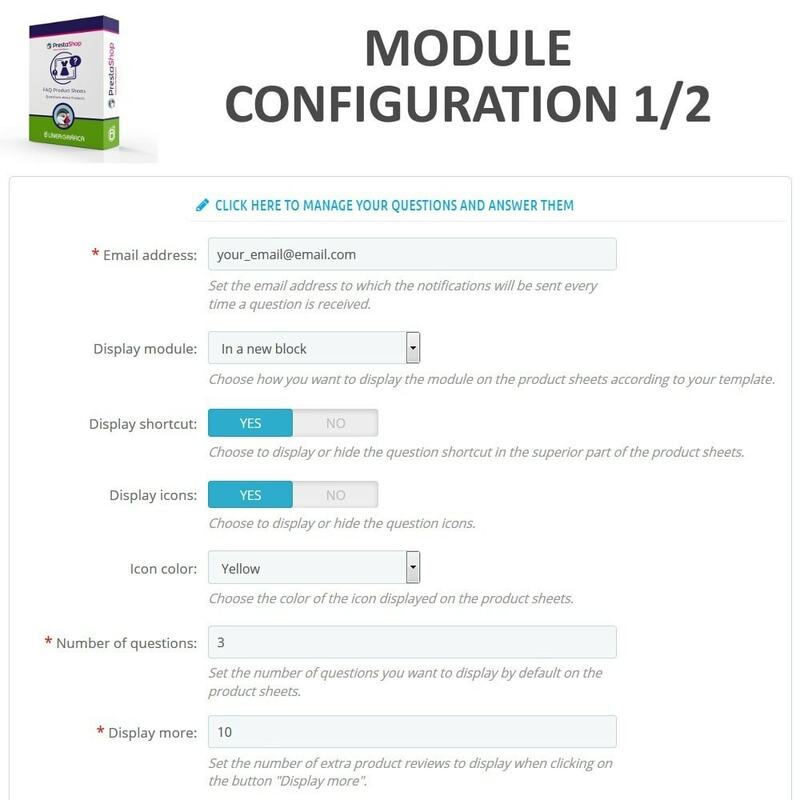 From the module interface, you can read all the questions sent by your customers, answer their questions, modify their questions (correct their mistakes) and choose to enable or disable the questions of your choice (visible or not on the frontend). 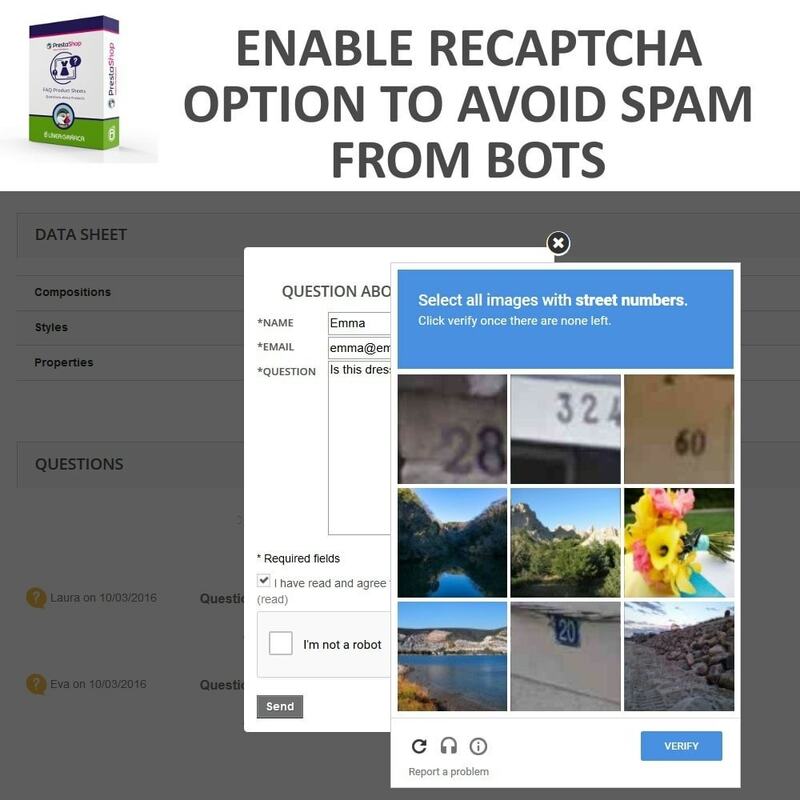 The questions sent by your customers are disabled by default on the frontend as long as you haven't enabled them to avoid displaying questions without answers, spam or inappropriate questions. 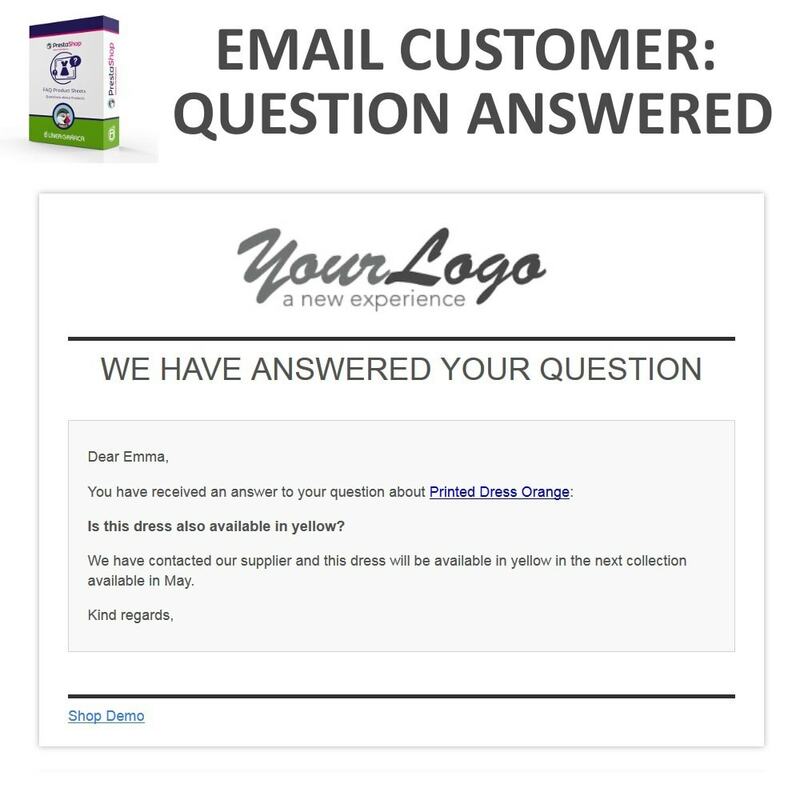 Each customer who have asked a question automatically receive a personal email with the answer to his/her question. 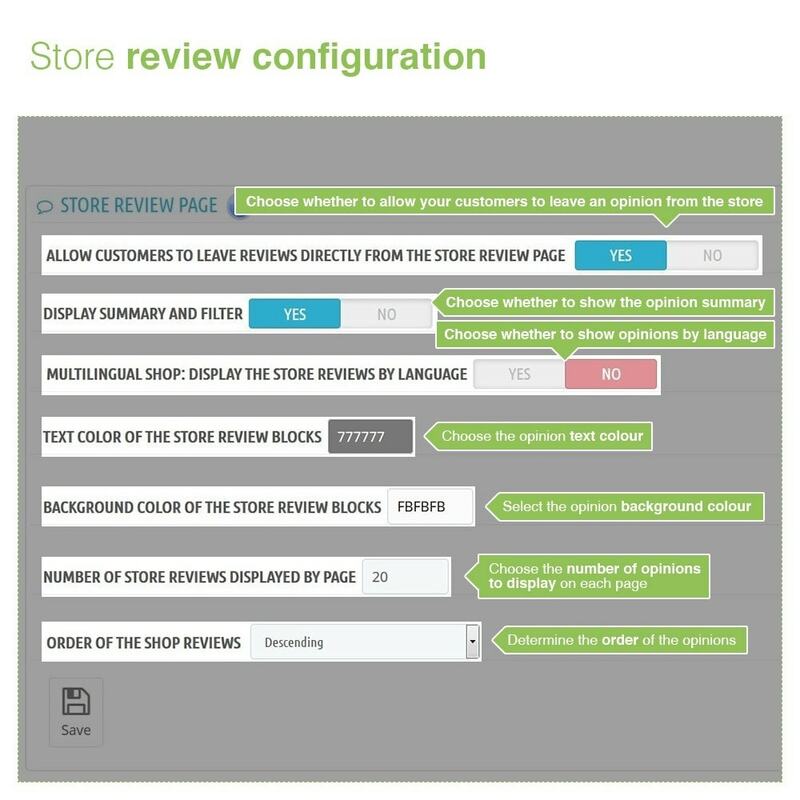 Then, all the other customers could read from each product sheet all the questions/answers that have been written about that product in order to help them in their buying decision and avoid that they ask for something that have been already asked in the past by another customer. 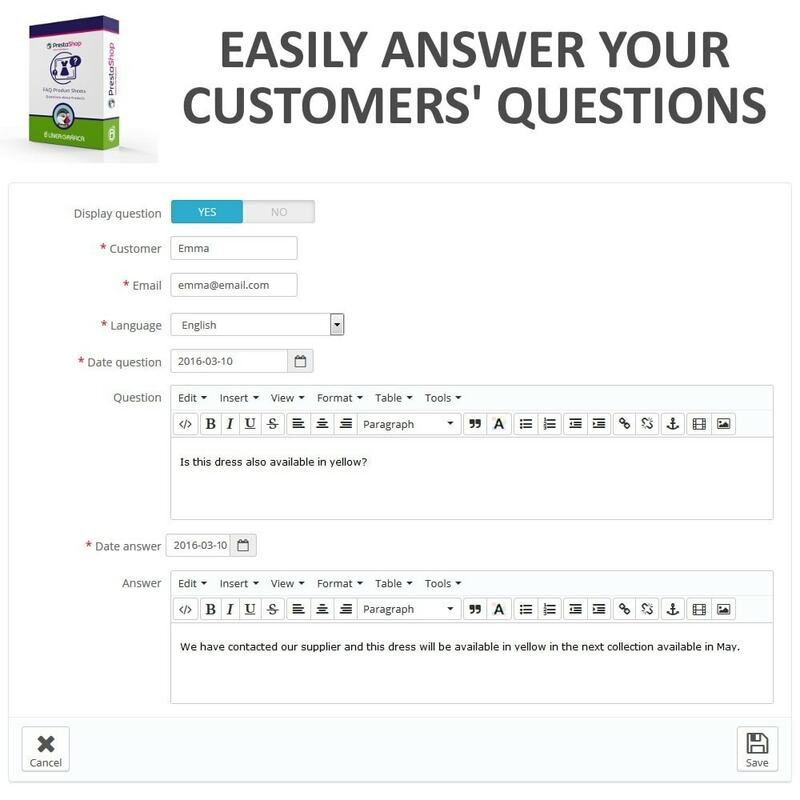 Very useful to reassure your customers and answer their questions about a product, helps to increase your conversion rate. 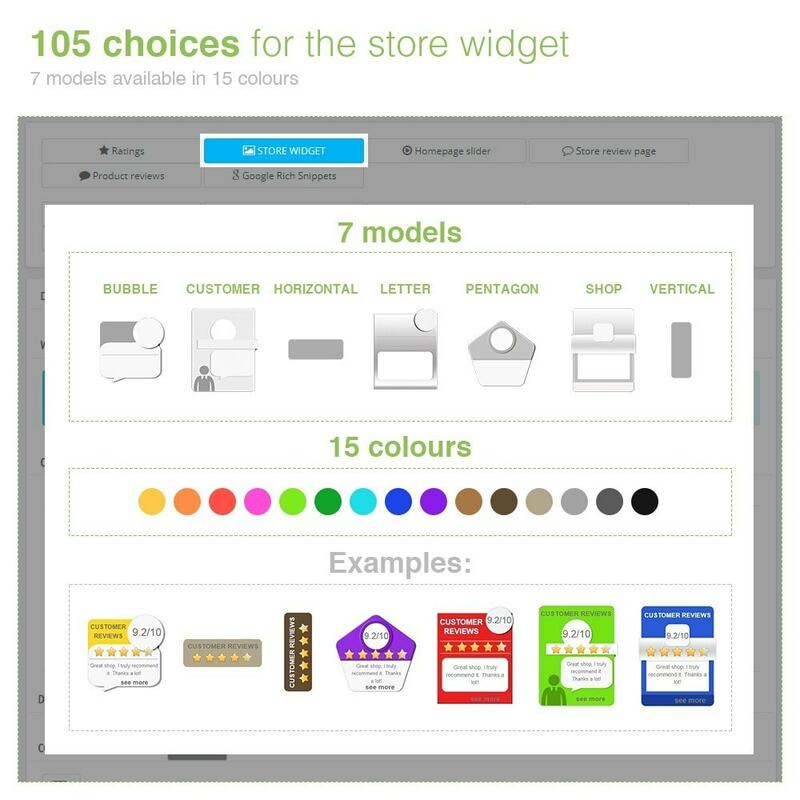 The module is compatible with PrestaShop multistore and can be used on your different stores. 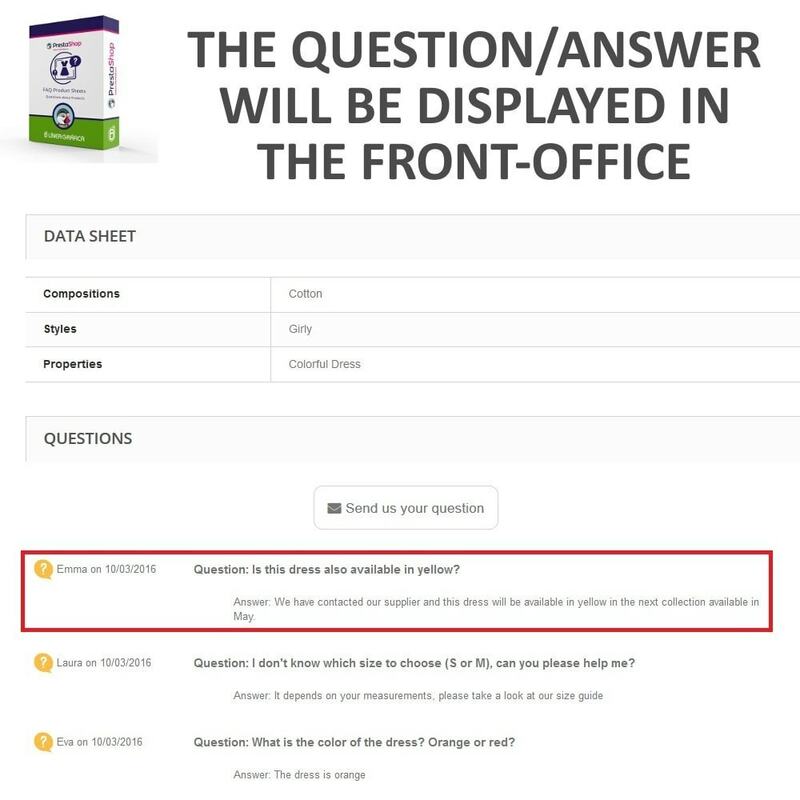 If you have the same product on different stores, the questions/answers about this product will be common to all stores and visible on all of them. 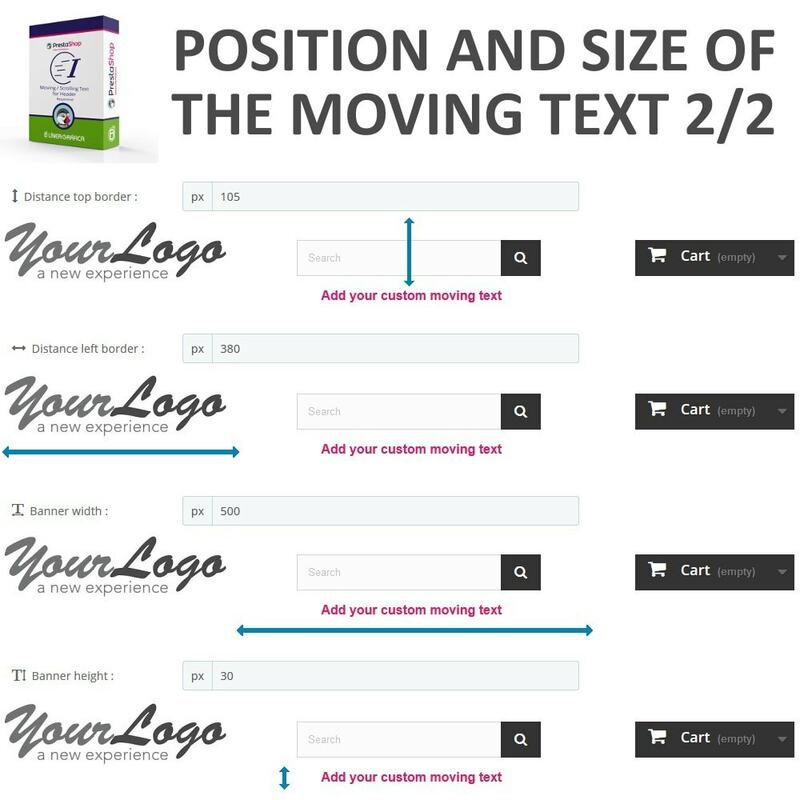 Choose the extra number of questions displayed when clicking on the button "Display more"
Great module, great developer, great support ! 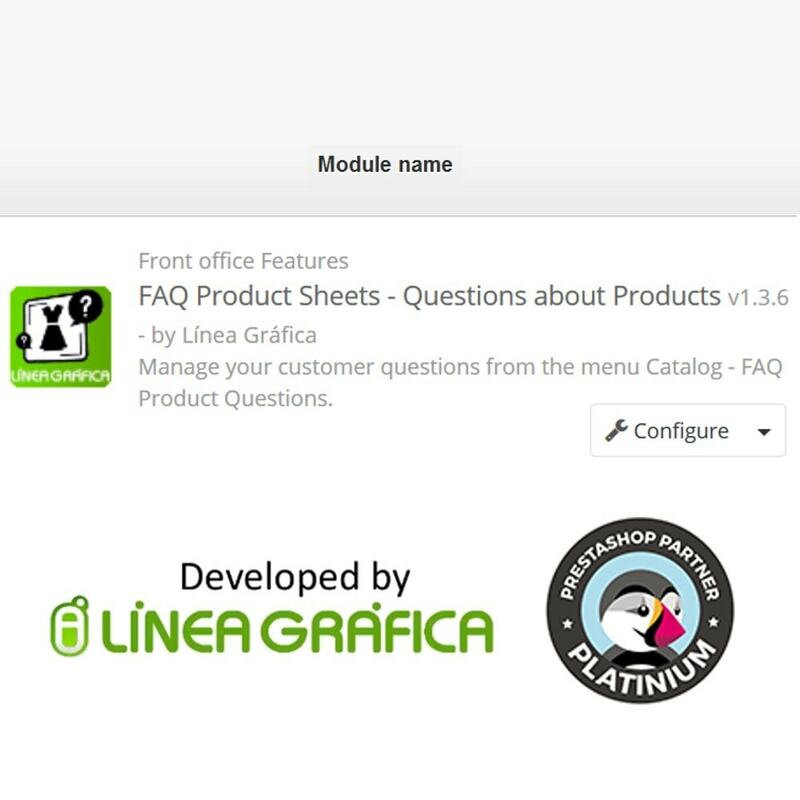 The module gives the possibility to your customers to ask their questions they'd like about the products of your store and read all the existing answered questions directly from the product sheets. 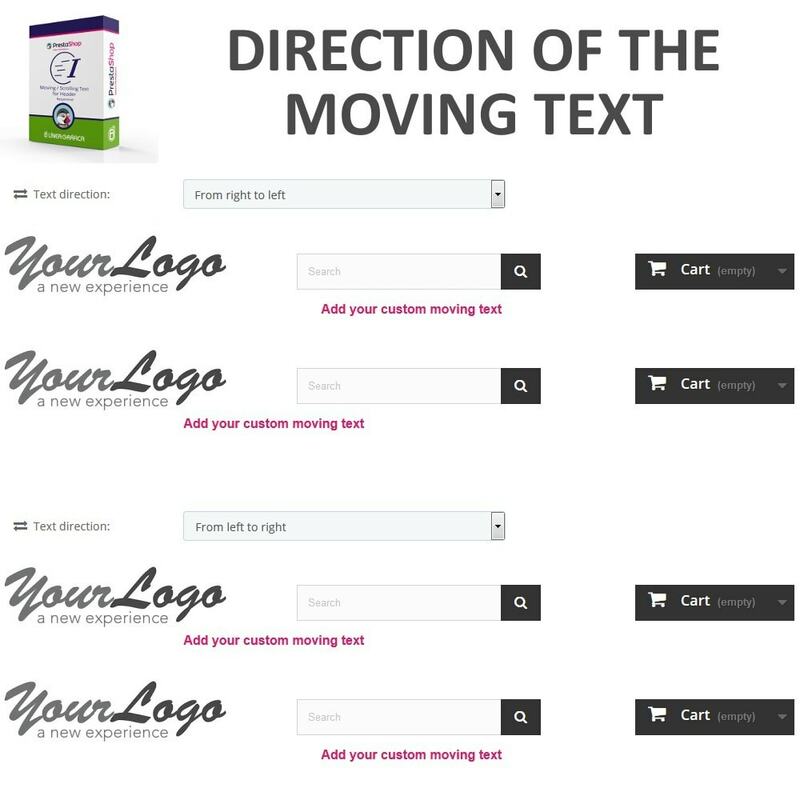 This tool allows you to reassure your customers and help them in their buying decision, as well as avoiding that they leave your website to find additional information and make them come back to read the answer to their question. 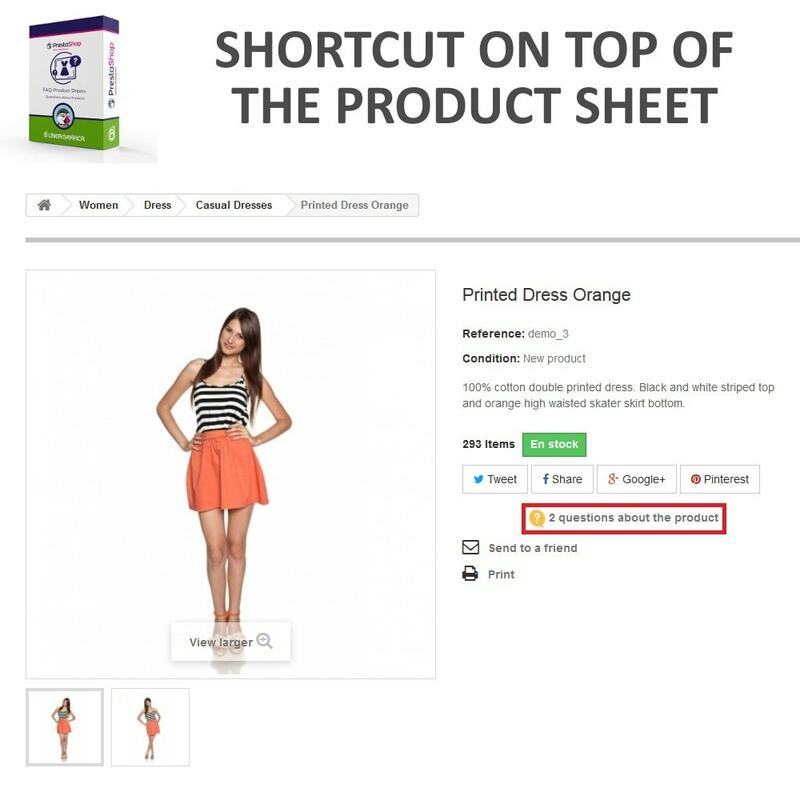 The reviews are common to all shops of the multistore. 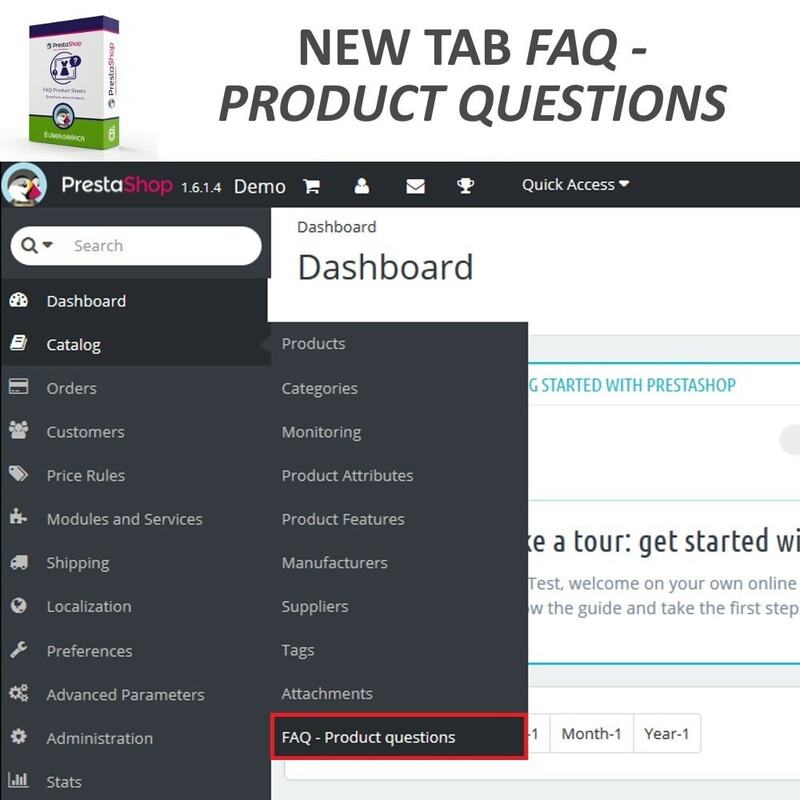 The questions/answers by product are common to all shops of the multistore.